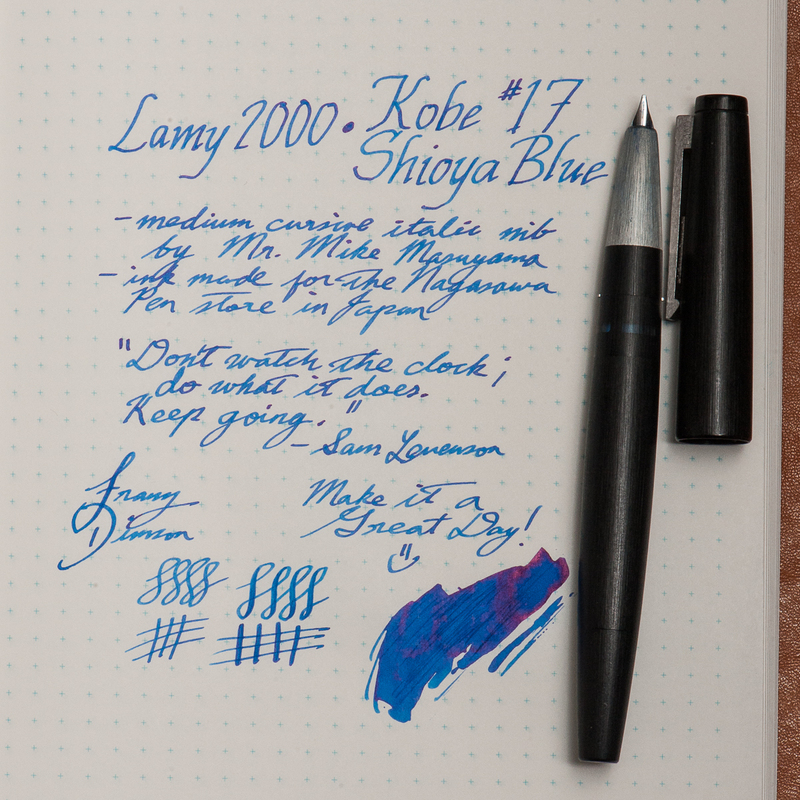 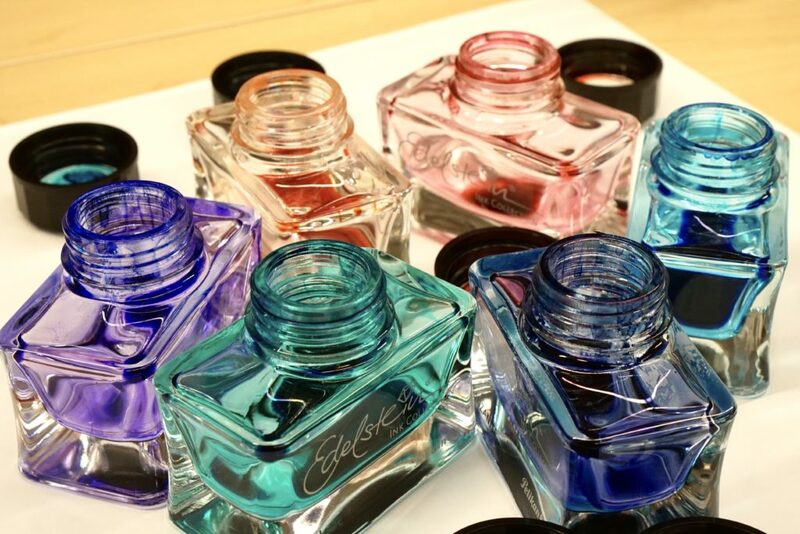 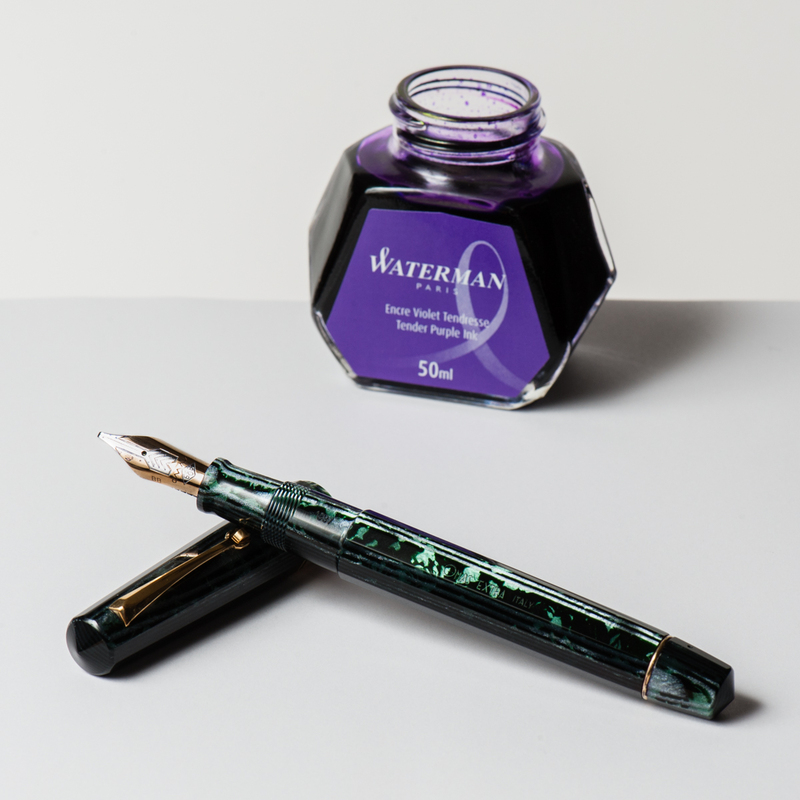 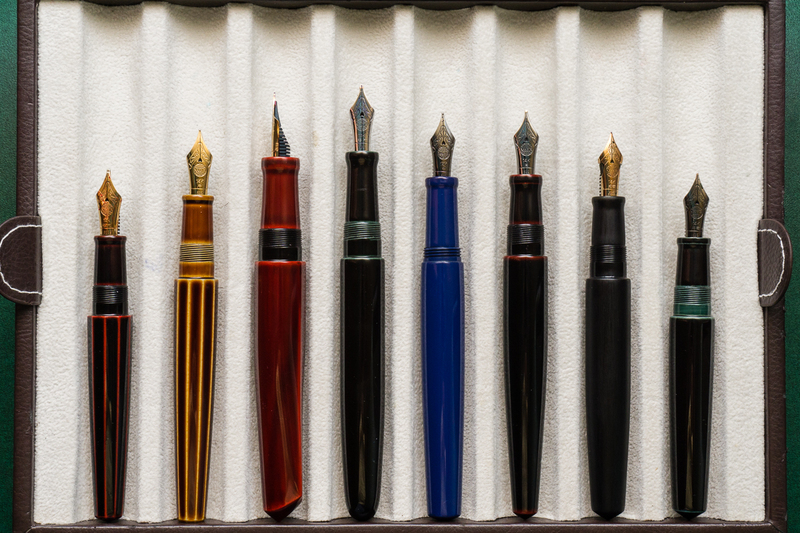 One of the age-old (not really) questions of the fountain pen hobby is… which Nakaya shape is right for me? 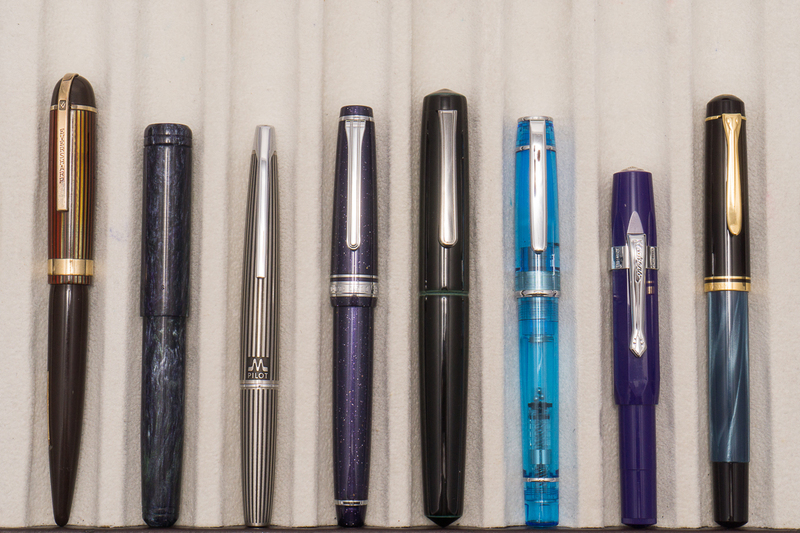 This post attempts to help answer that question, and do a comprehensive side by side of the different sizes available. 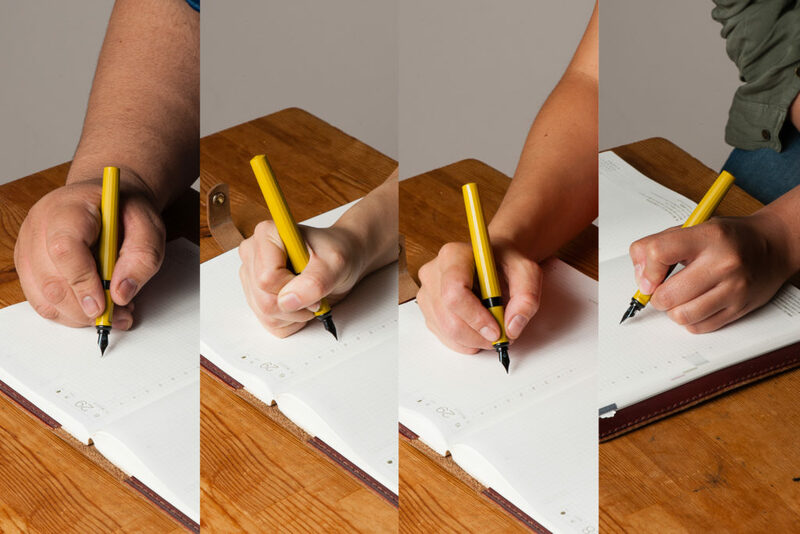 There is an official comparison chart, but we have found that it’s not terribly helpful for getting a feel of what a particular shape might be like in hand. 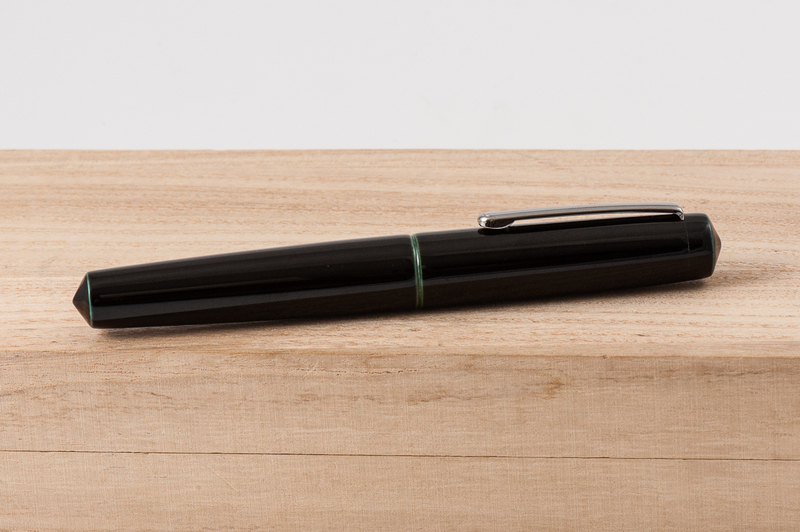 We’ve included every Nakaya shape except the Desk Pen. 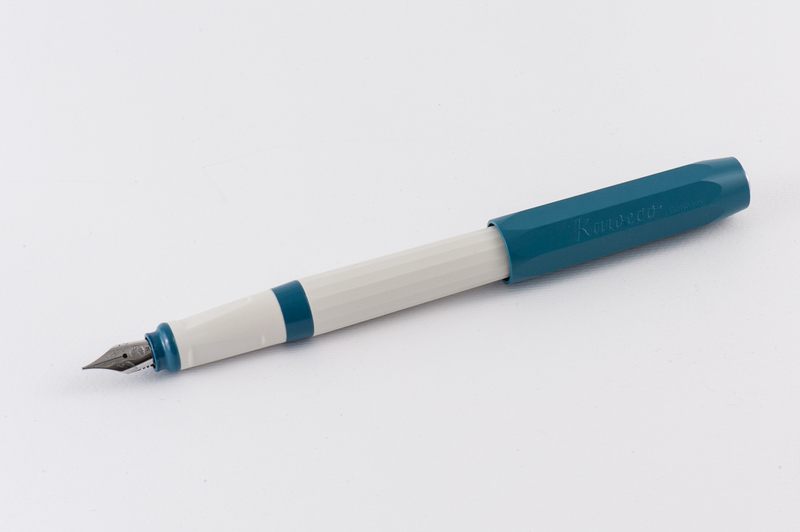 (Please feel free to send us one… we promise to give it a good home!) 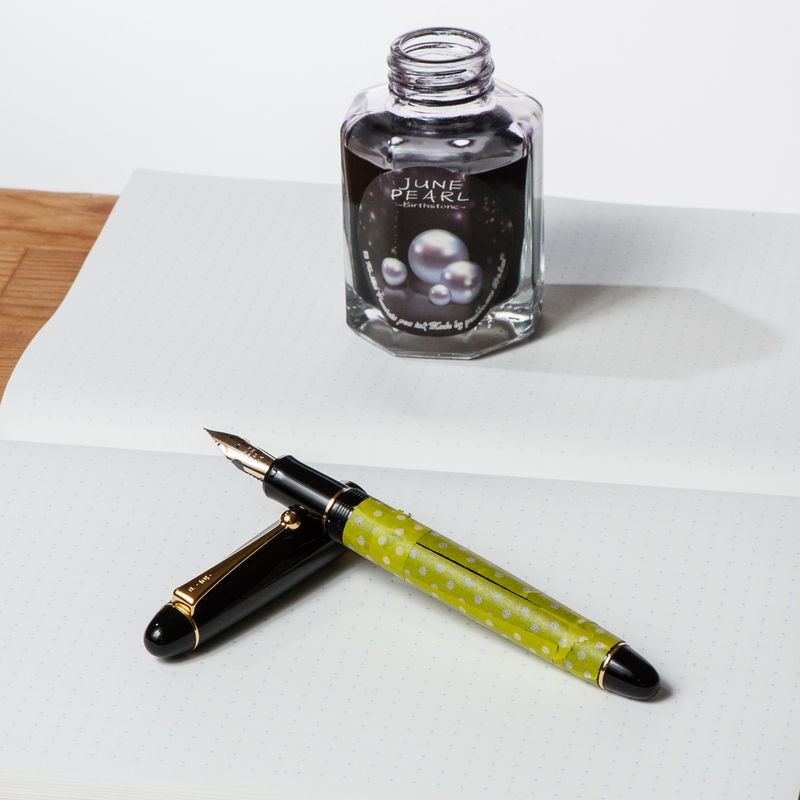 It is worth noting that the Decapod Mini is discontinued, and the Dorsal Fins are both paused for new orders right now. 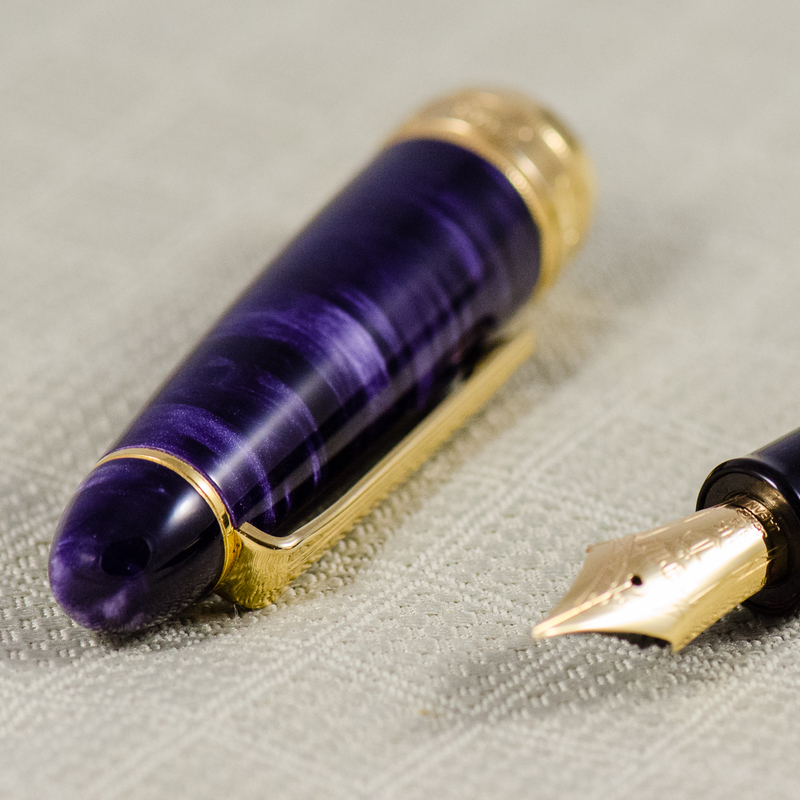 I had initially worried that the “full size” Nakaya pens would be too long for me to use comfortably, but the ebonite and urushi are so light, that it really doesn’t make that big of a difference over the Piccolo unless I compare side by side. 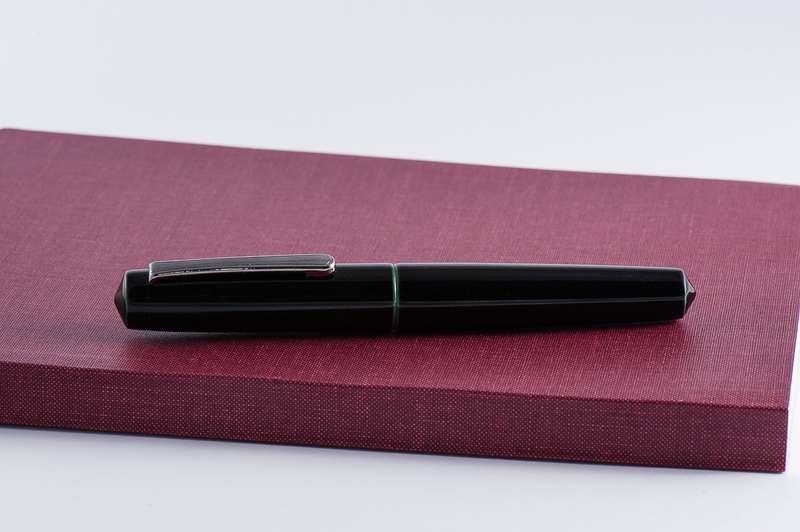 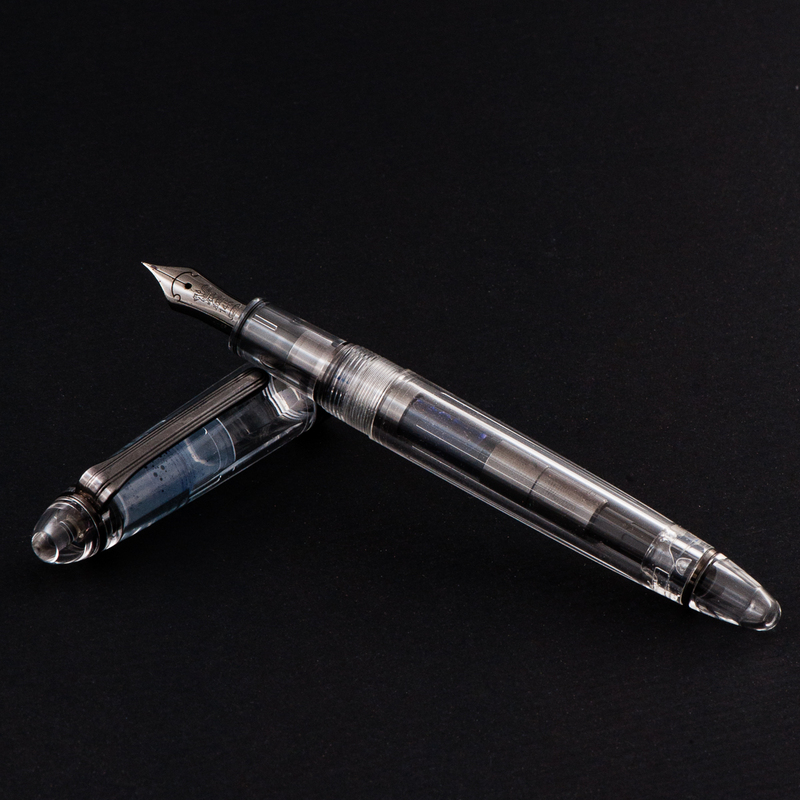 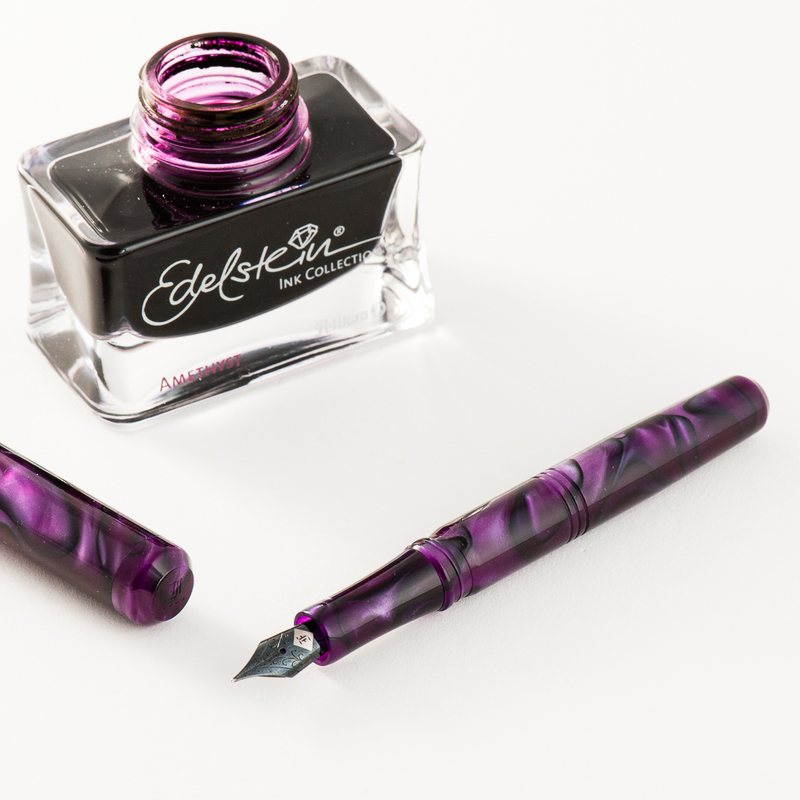 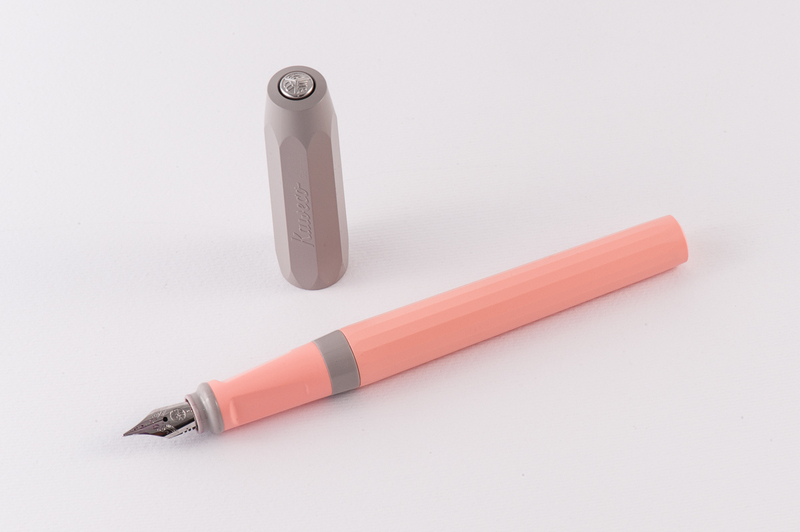 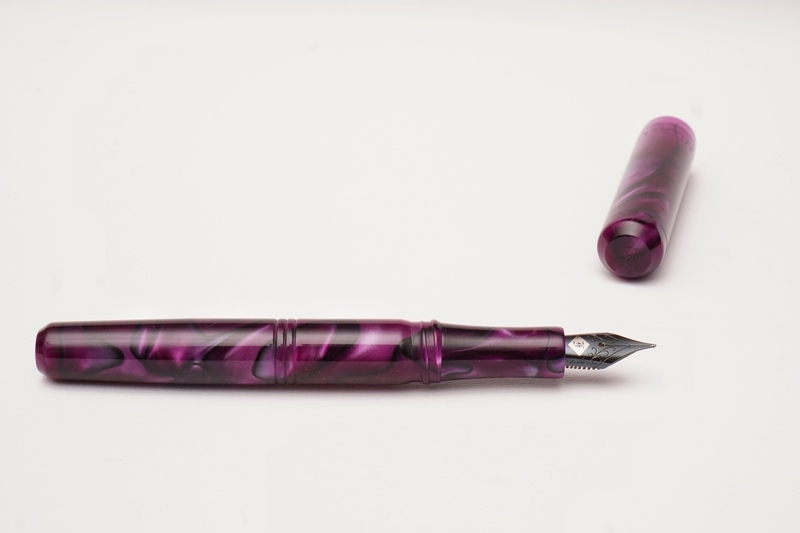 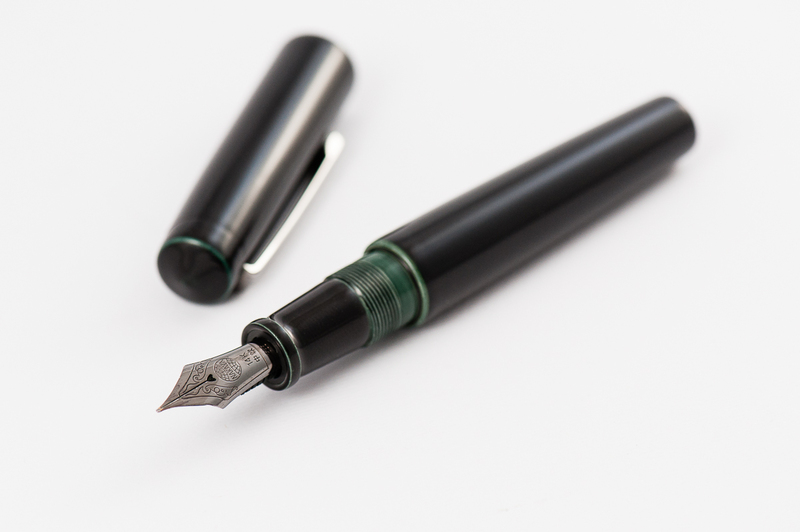 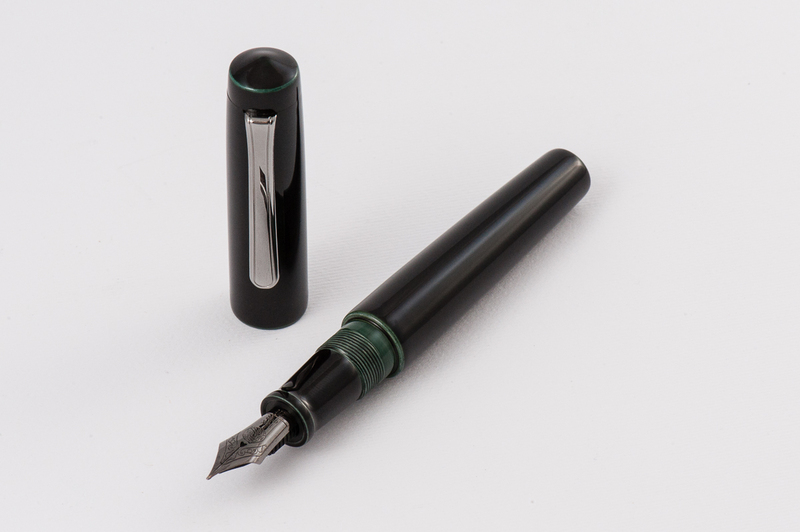 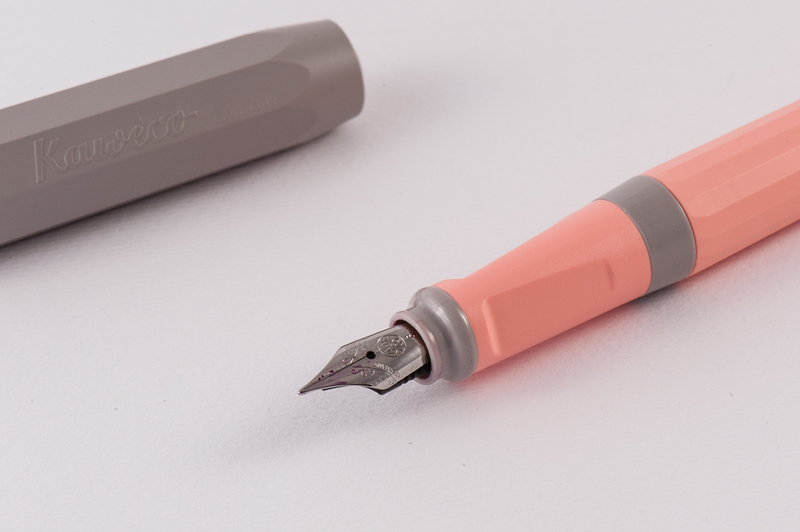 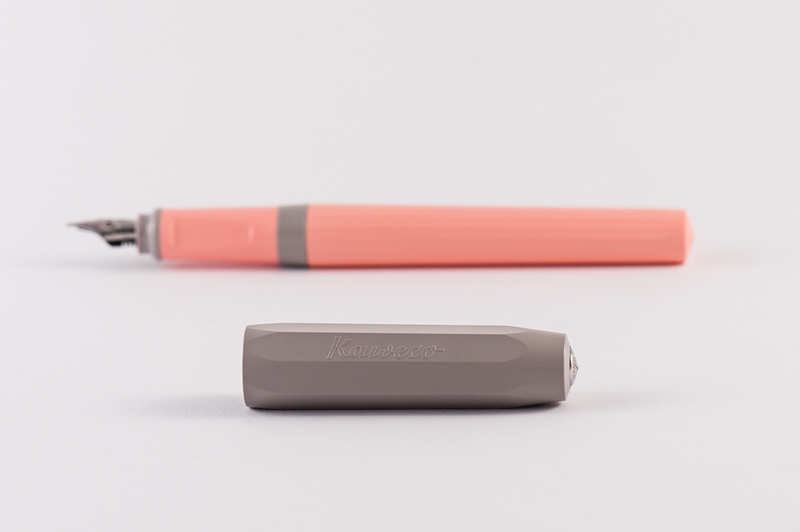 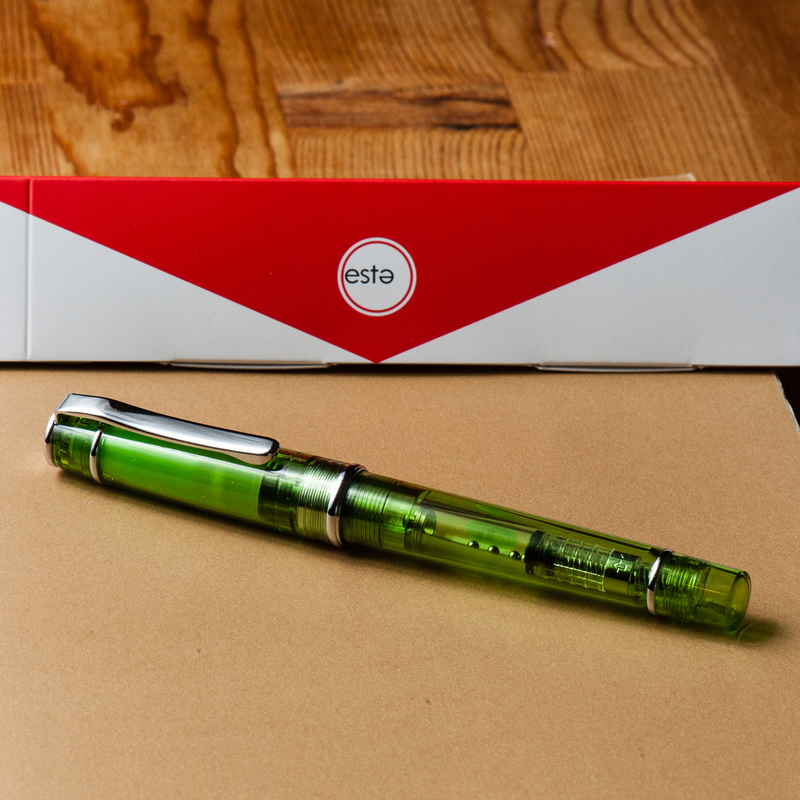 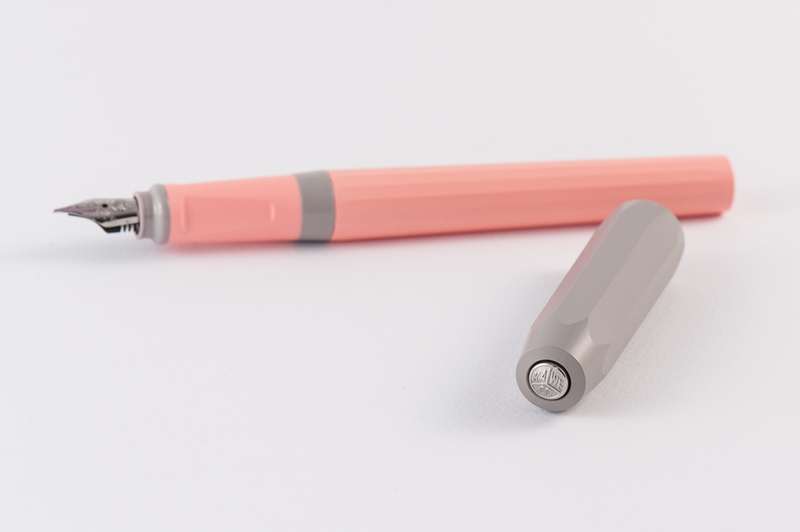 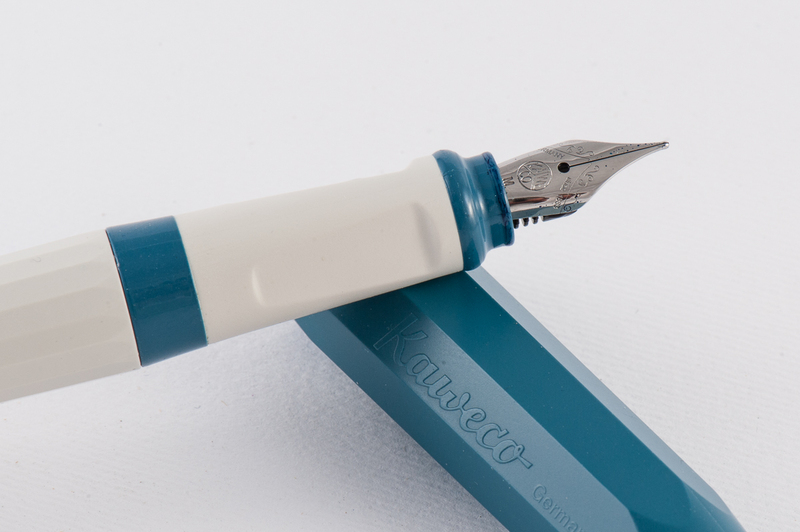 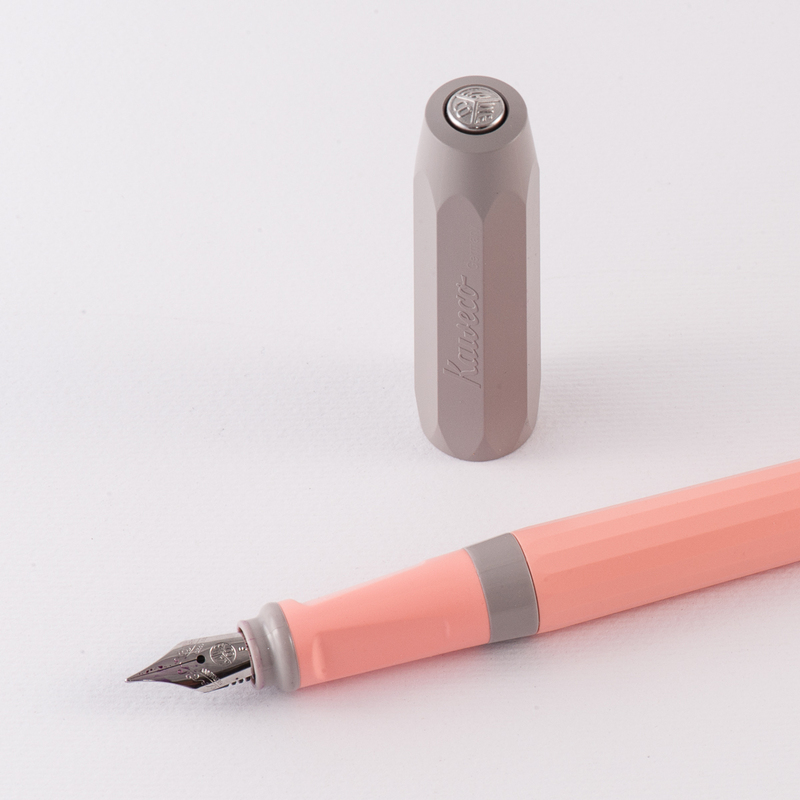 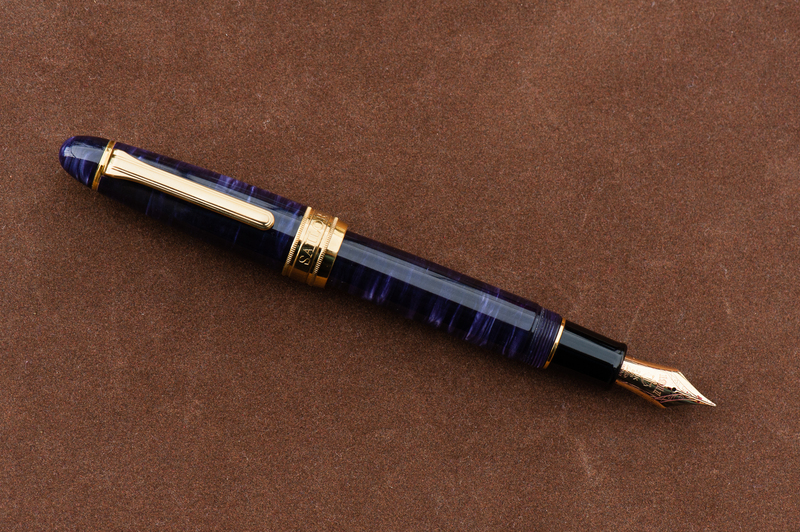 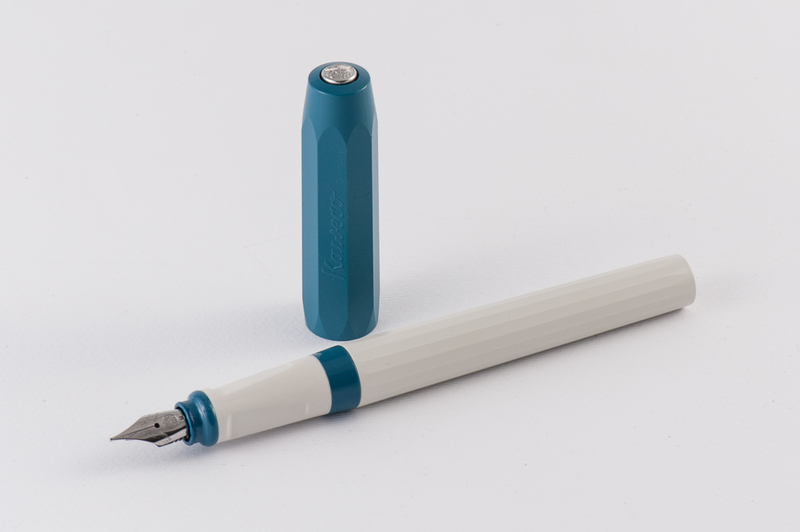 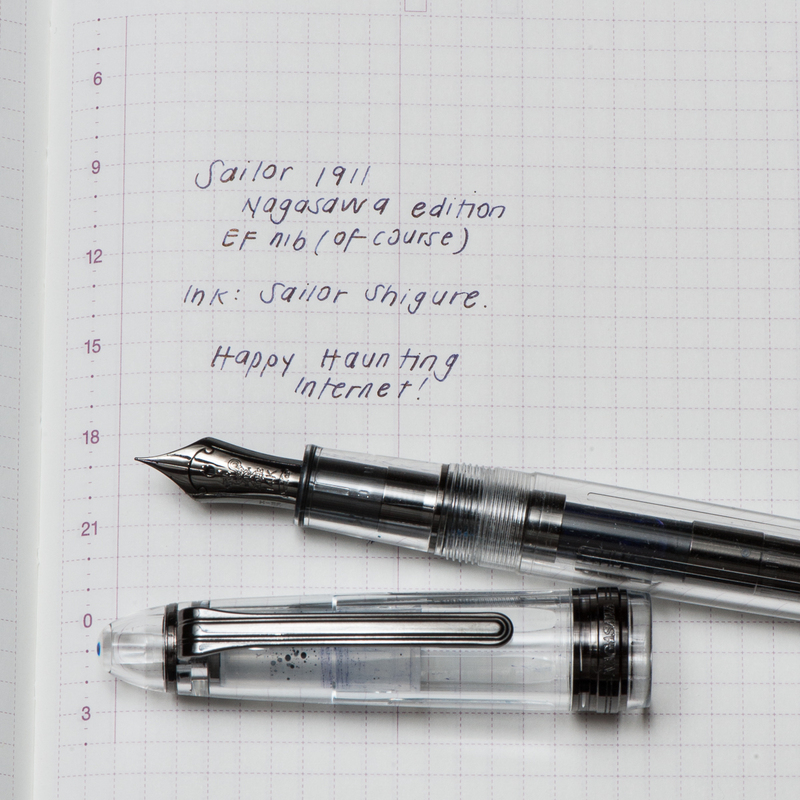 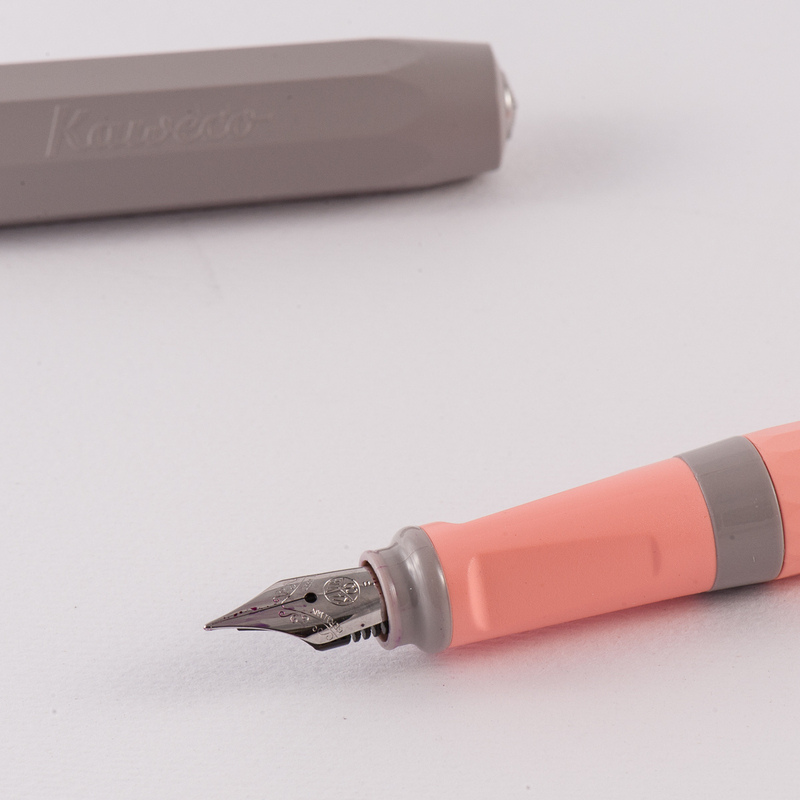 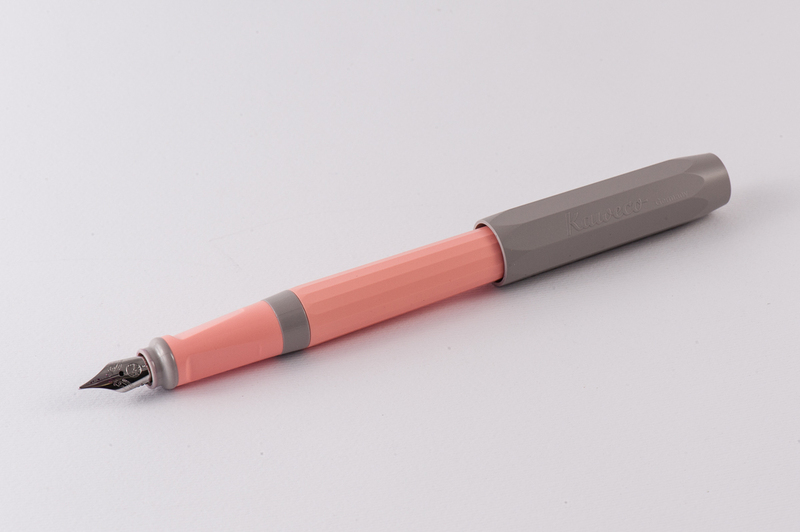 If you prefer heavier pens, the Piccolo/Decapod Mini are certainly not for you. 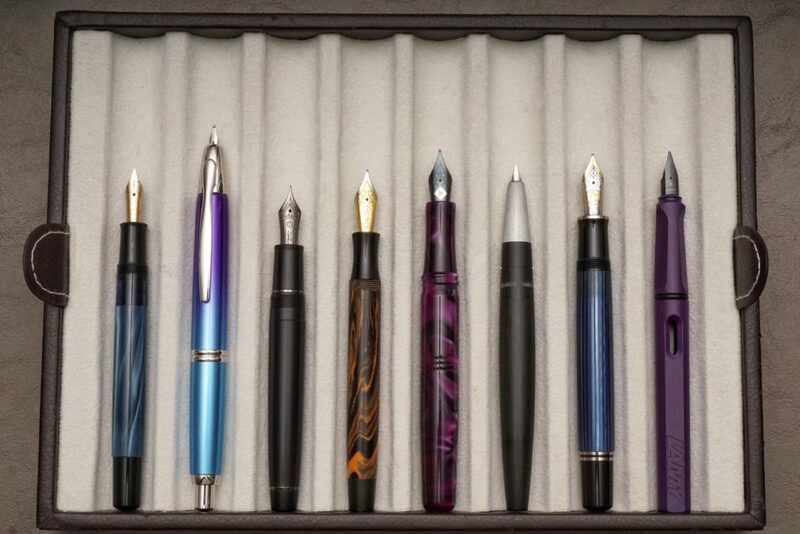 Actually… I’m not sure any of the Nakaya are. 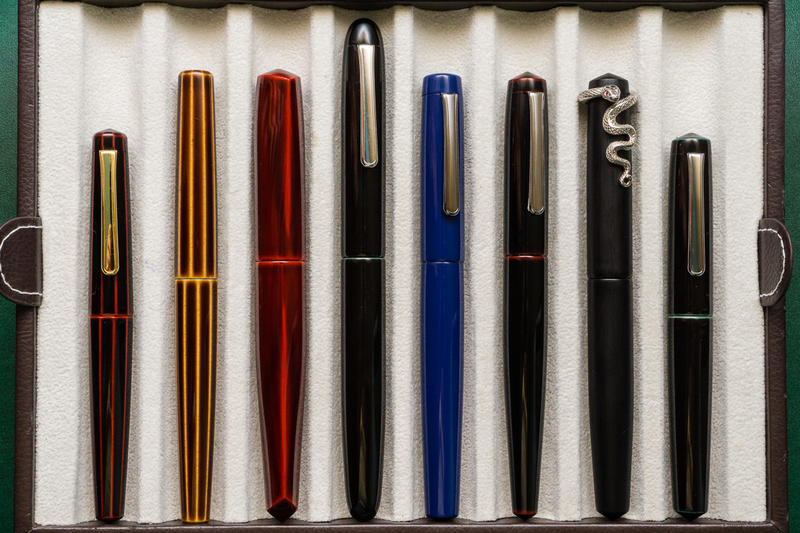 Pam: Not surprisingly, with my love for the pens that are either pocket or petite, my favorite shape to hold is the Piccolo. 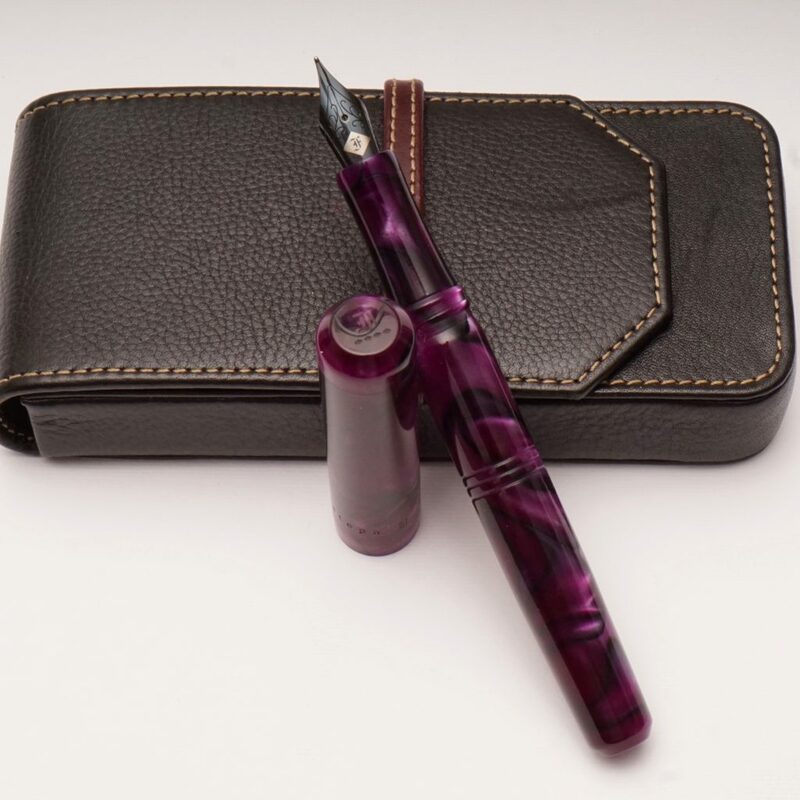 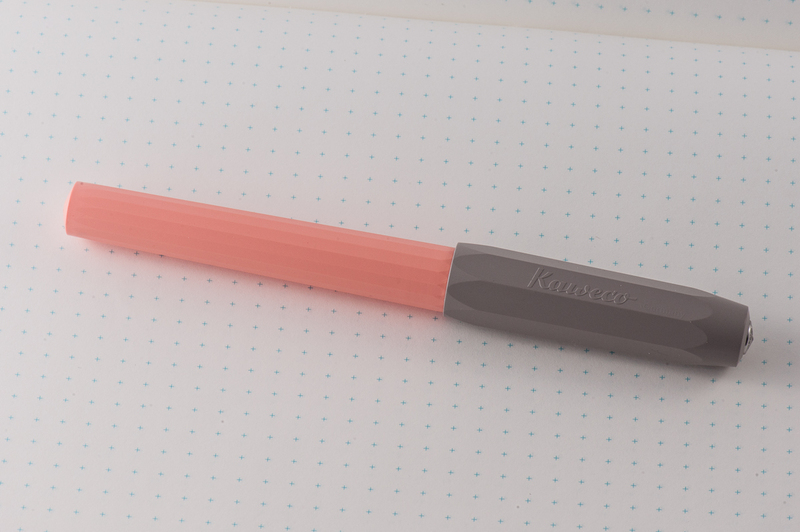 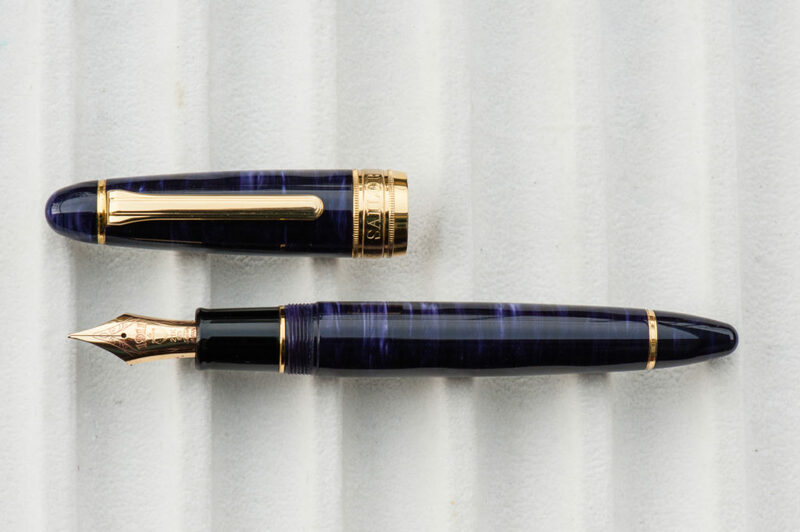 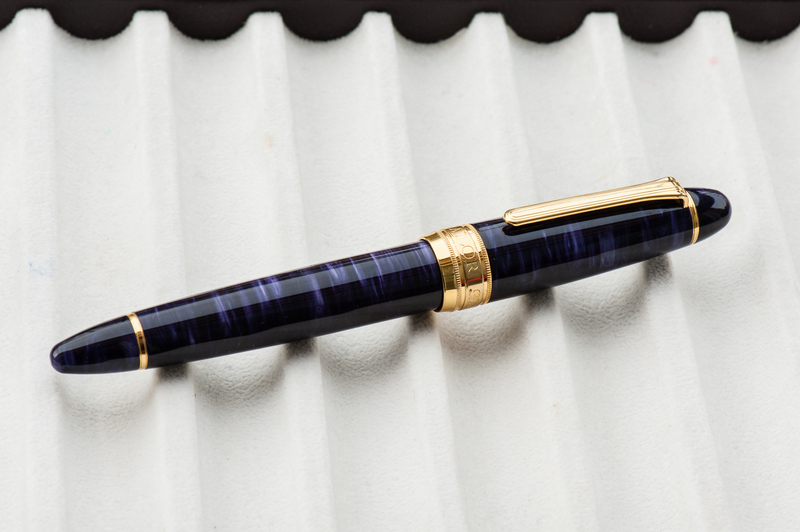 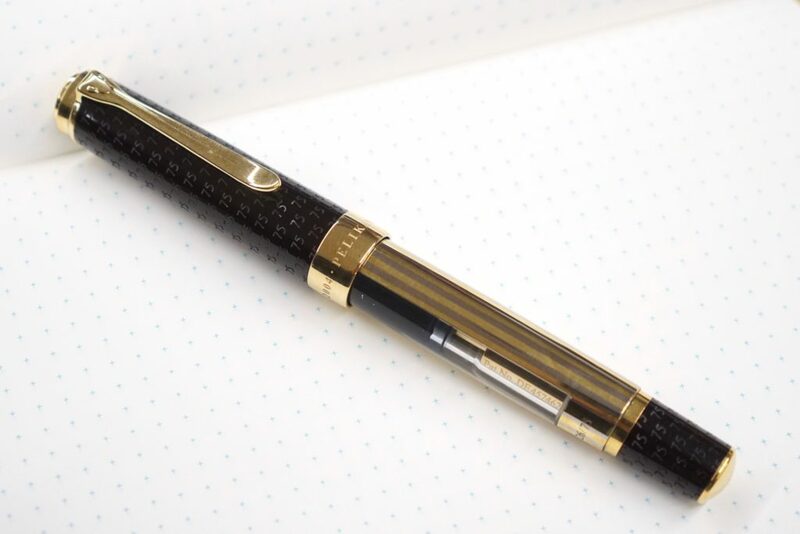 Honestly, Katherine’s Piccolo with the Negoro finish was so compelling to use that I was afraid to use it “too much,” in fear of wanting to purchase a Nakaya for myself. 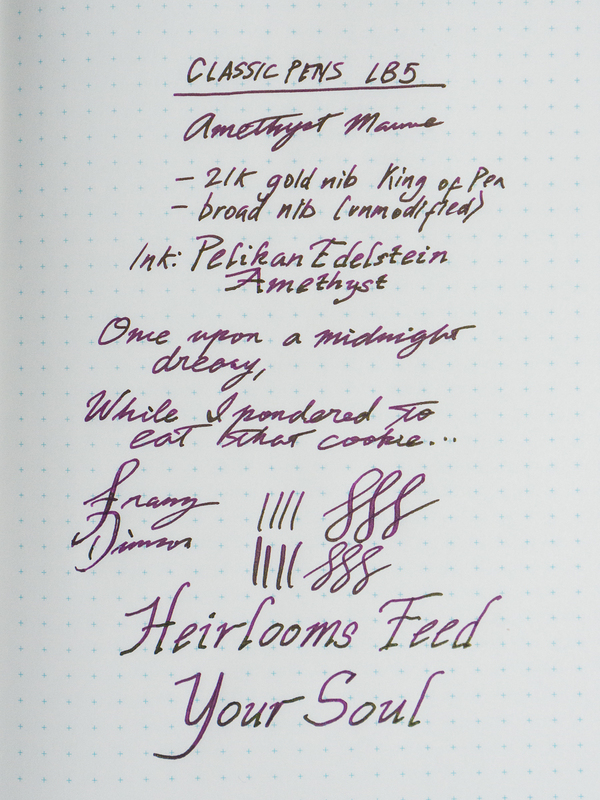 The threads are not sharp so despite my grip, it doesn’t dig in. 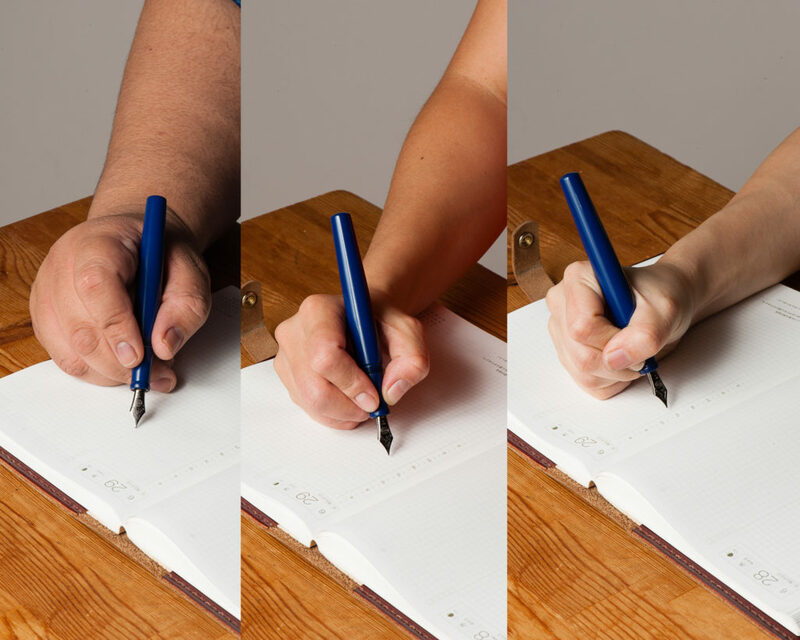 My pointer finger rests comfortably on the section. 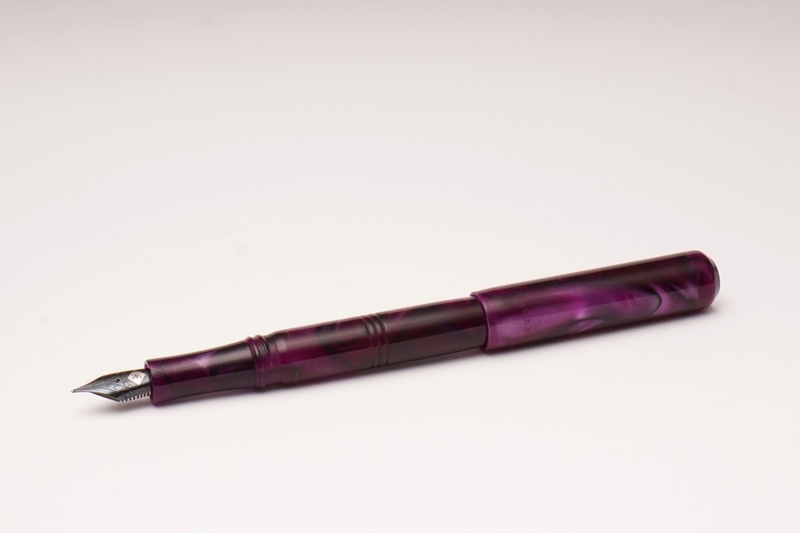 Unfortunately, the Decapod Mini does have quite a step so my grip isn’t as compatible with that amazing pen. 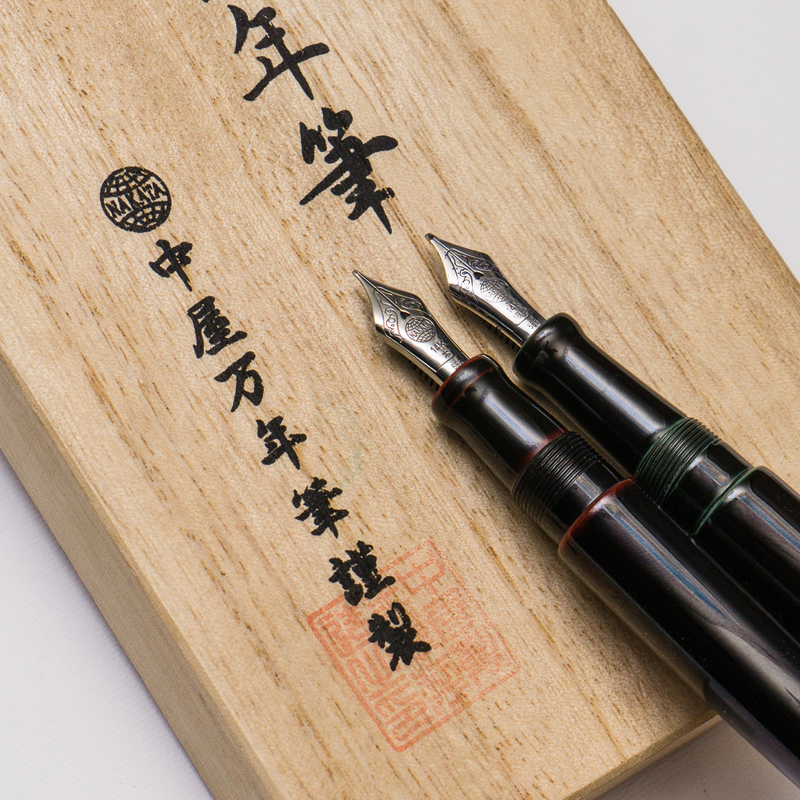 I find some of the larger sizes of the Nakayas, like the Naka-ai, to be too top heavy, or too long for me. 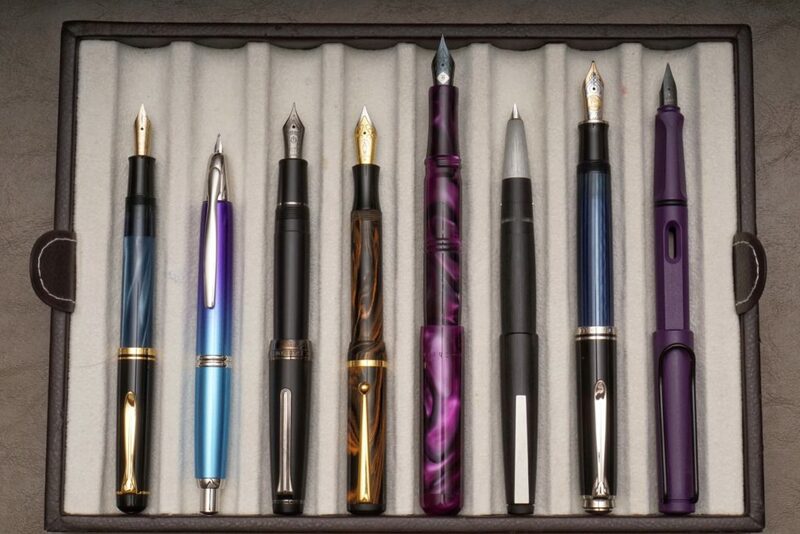 The Neo-Standard, likely due to having the same section as the Piccolo, is my favorite of the regular sized pens. 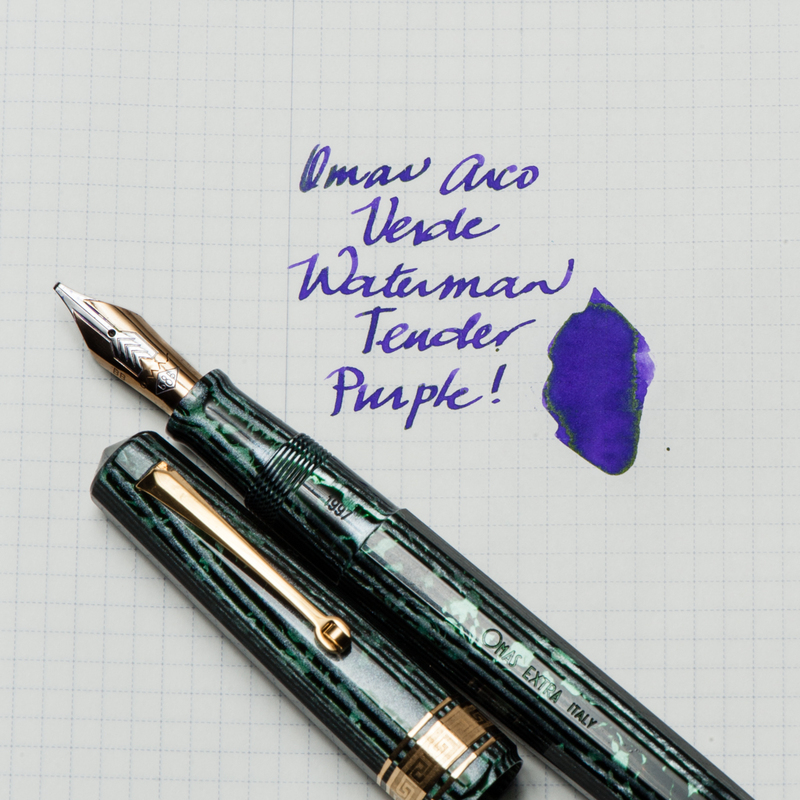 It’s pretty comfortable despite being quite a bit longer than the Piccolo. 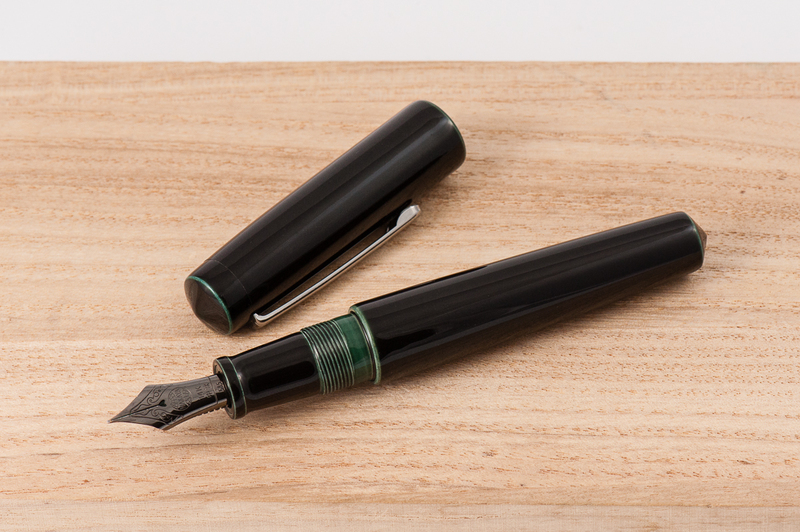 Now, for my “white whale/mother of all the grails” of a pen, the Nakaya Dorsal Fins. 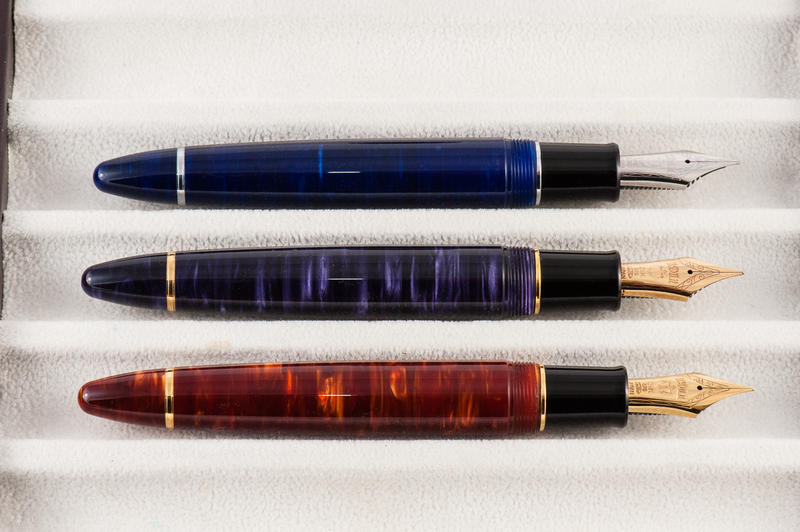 Unfortunately, orders for the Dorsal Fins are currently on pause due to overwhelming demand. 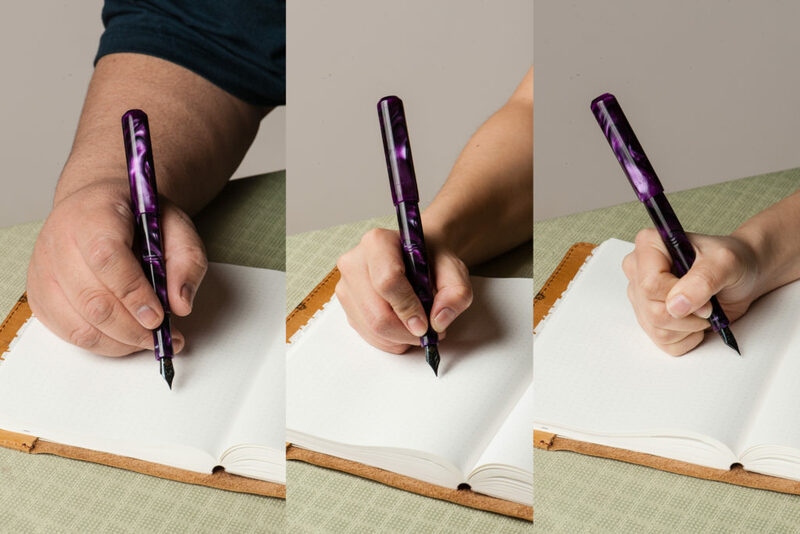 Dorsal Fin version 1 has a completely cyclic barrel making it similar to the size of the Neo-Standard in hand. 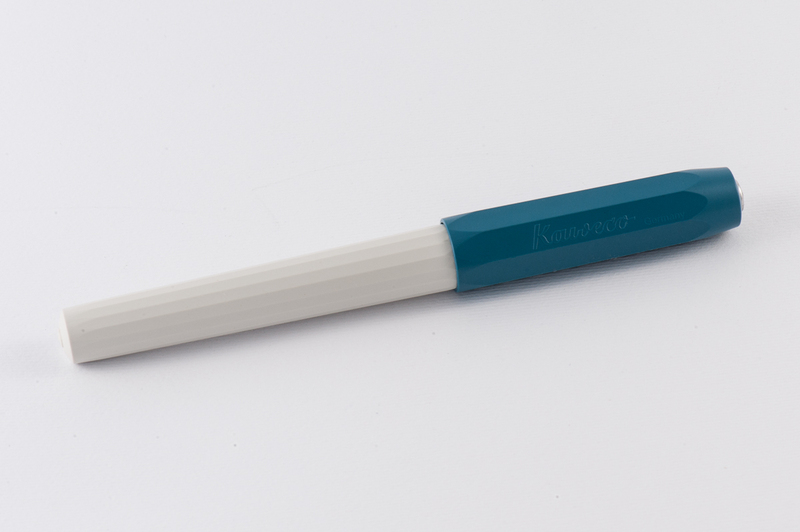 If you like the Neo Standard, the Dorsal Fin version 1 would be perfect. 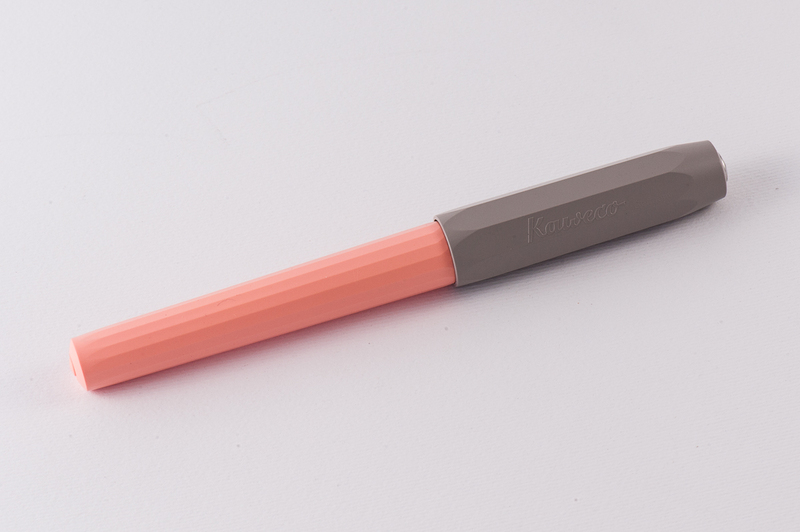 Design-wise, I prefer the look of version 2, where the “fin” is extended to the body. 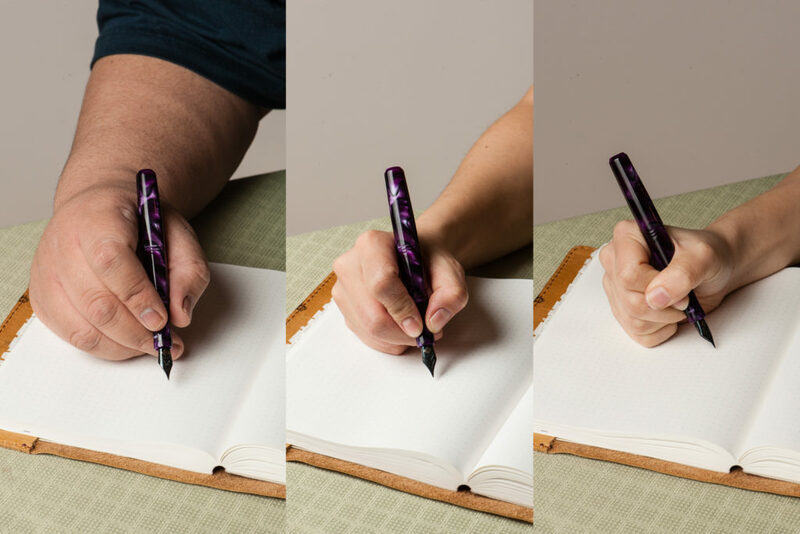 It didn’t occur to me until I got to try a Dorsal Fin version 2 in hand but the “fin” part of the body can be oriented to your hand! 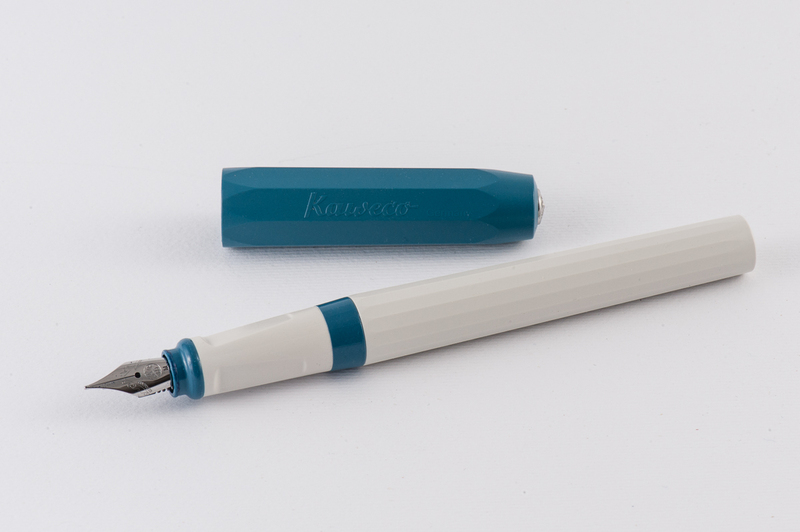 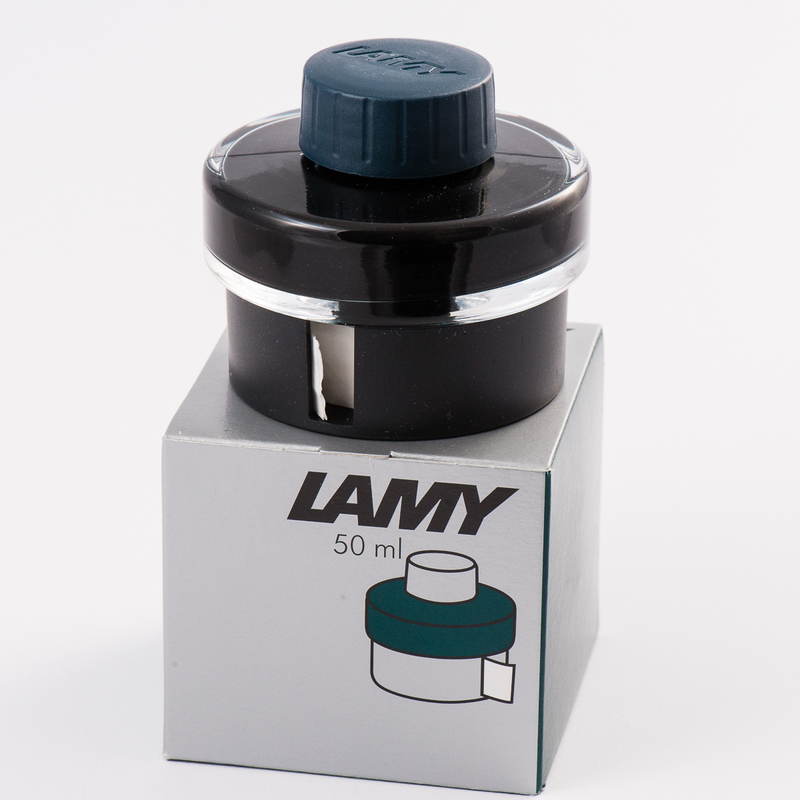 Just take the feed and nib out and set it (carefully, of course) to what is most comfortable for you! I prefer having the fin turned towards the fleshy part between my thumb and pointer finger for optimal comfort. 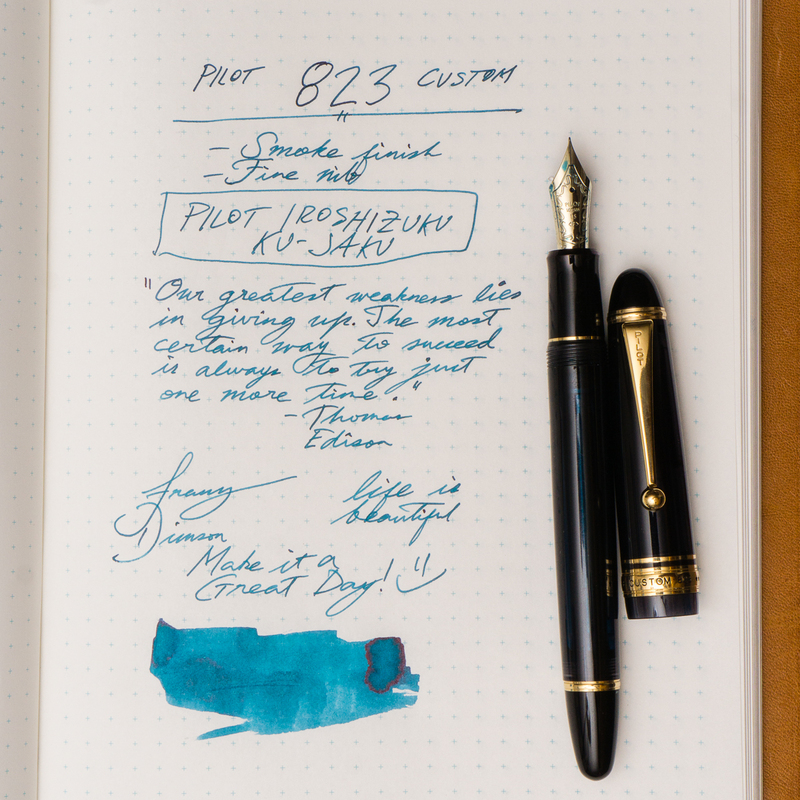 The fin reminds me of the clip on a Pilot VP so if you don’t like the VP due to the clip, consider flipping the Dorsal Fin body or going for version 1, if the Dorsal Fin is the holy grail for you too. 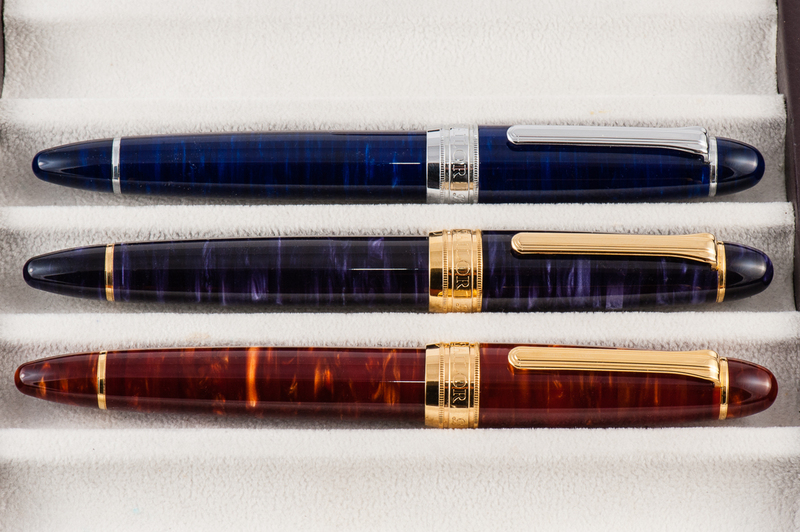 Franz: As the bearpaw-ed person in this trio, of course I would prefer the larger pen models in the Nakaya line up. 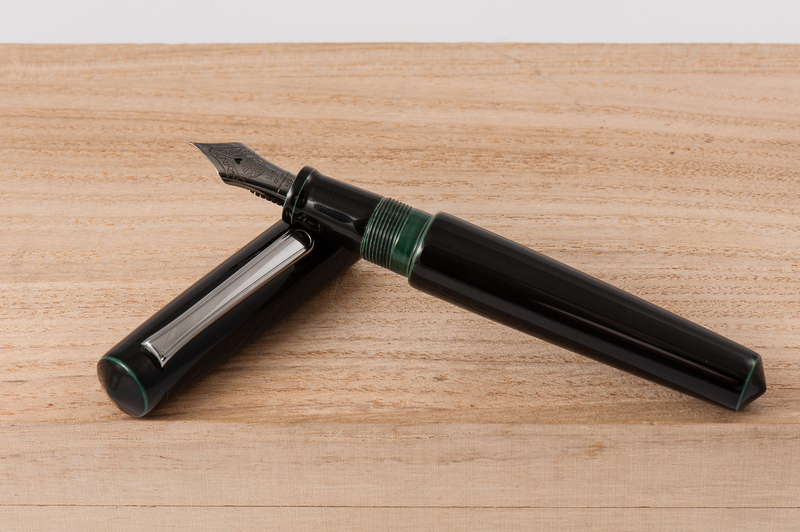 The Neo Standard would be my favorite Nakaya model but it really was a close competition against the Naka-Ai. 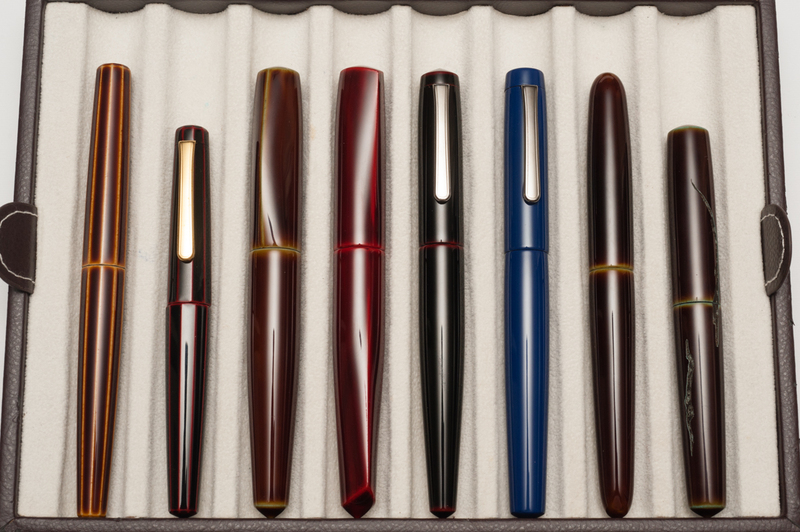 The longer section of the Neo Standard slightly edged the Naka-Ai to be my second favorite. 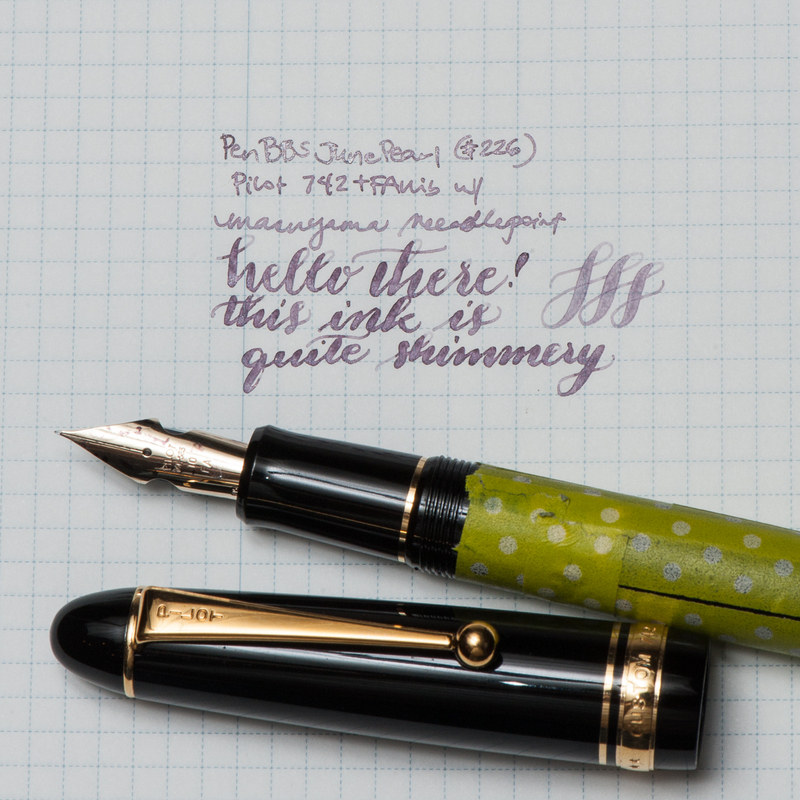 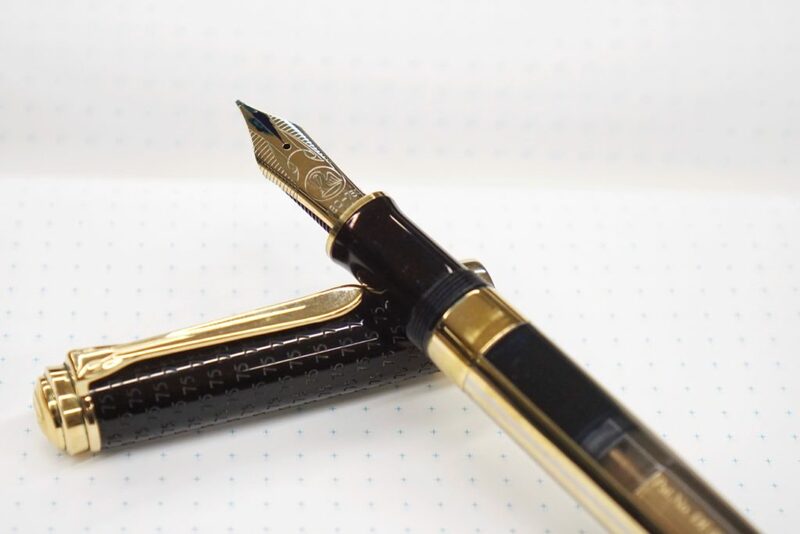 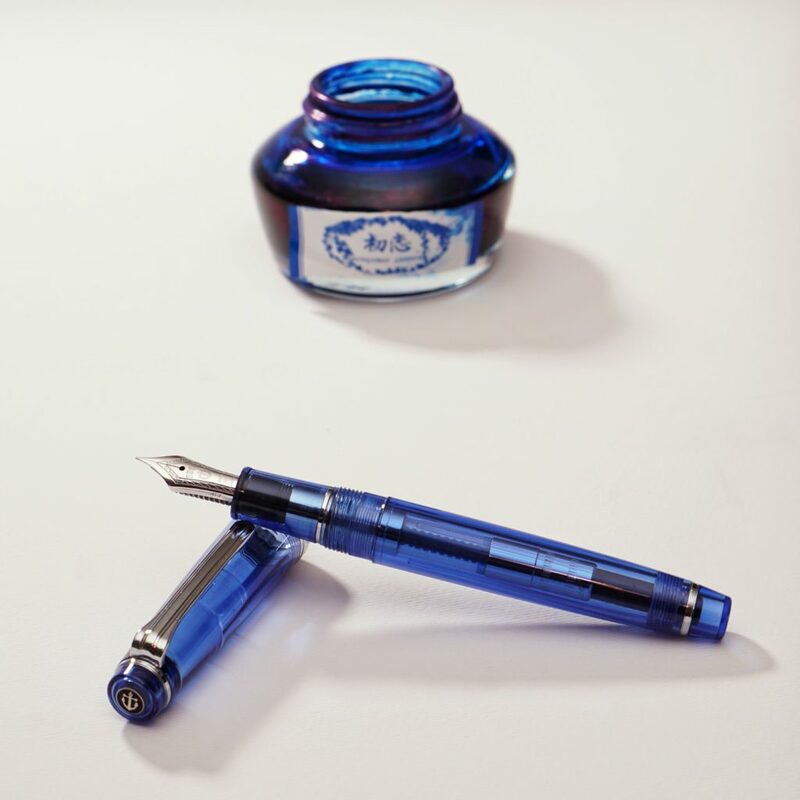 The Neo Standard just feels so nice and snug for my hand just like how a Pelikan M1000 does for me. 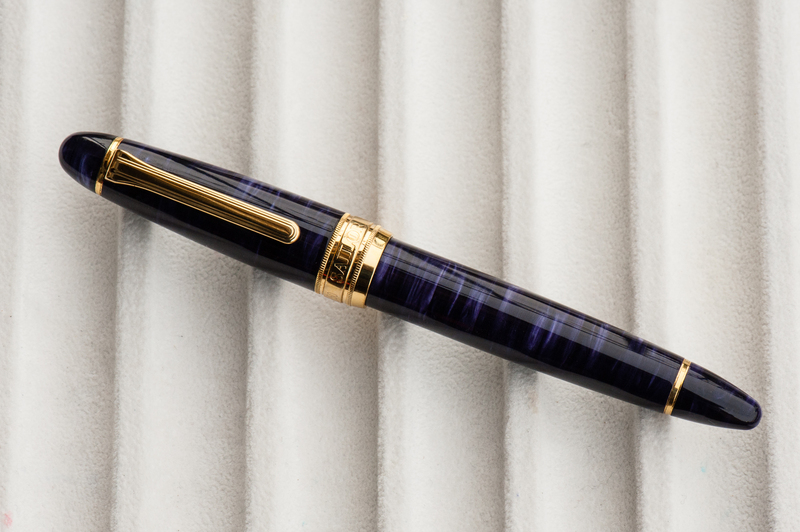 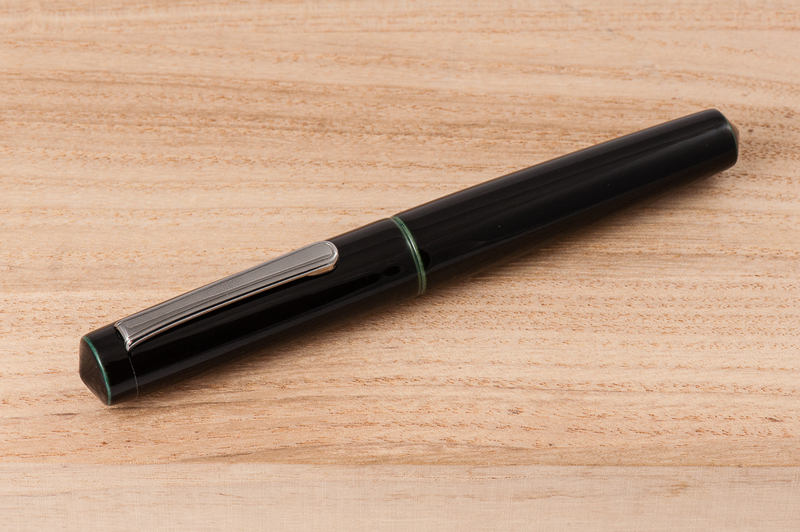 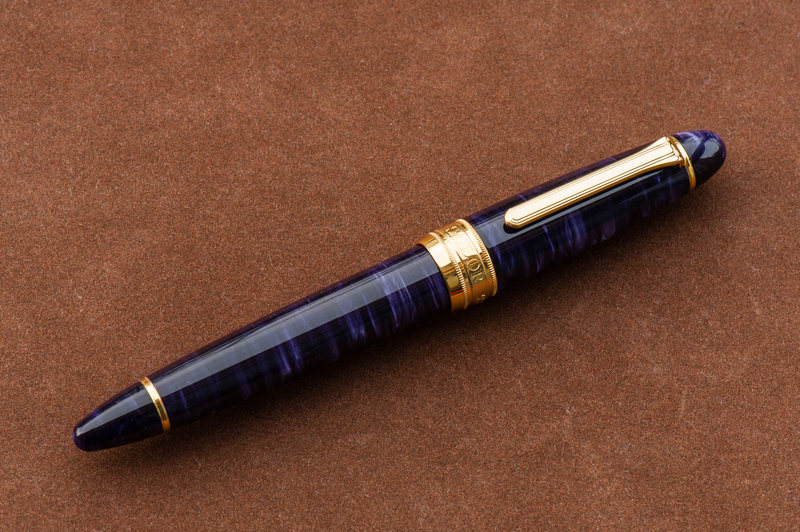 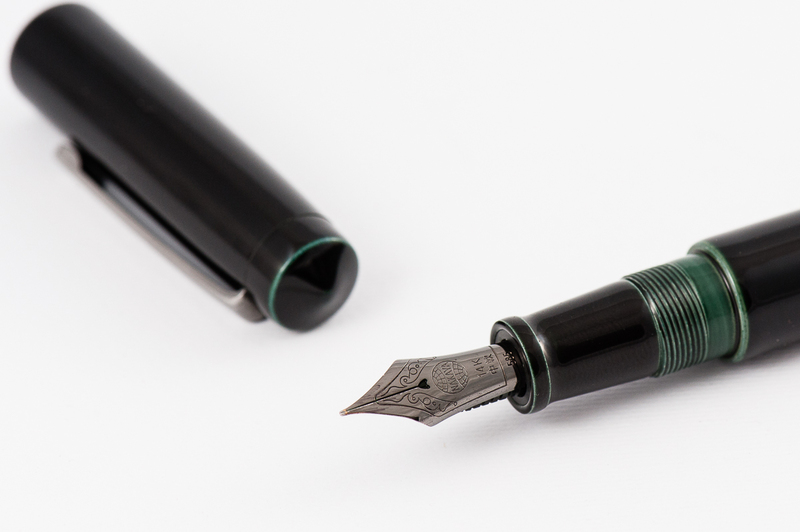 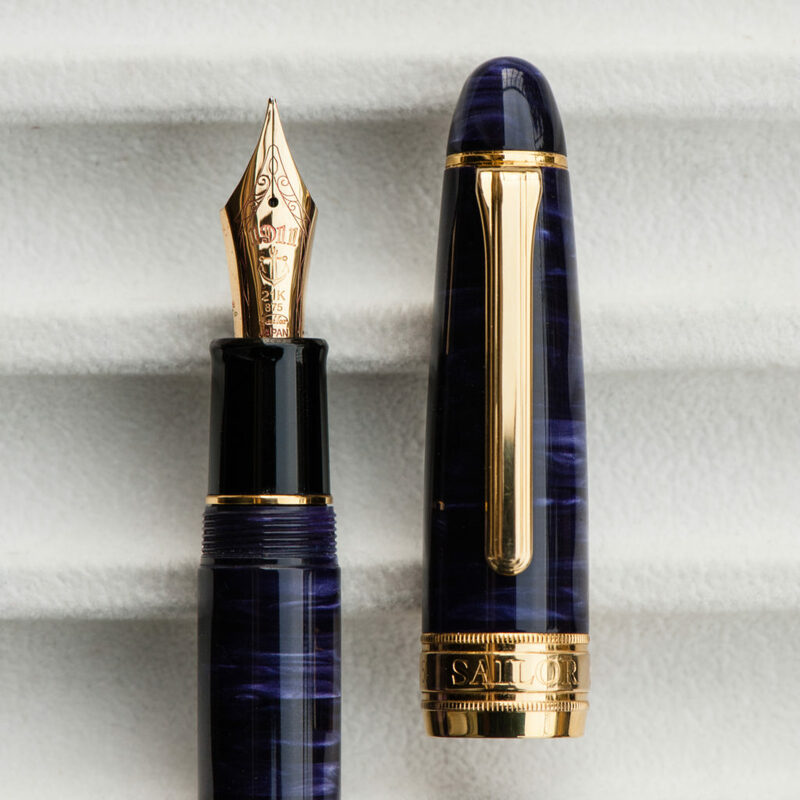 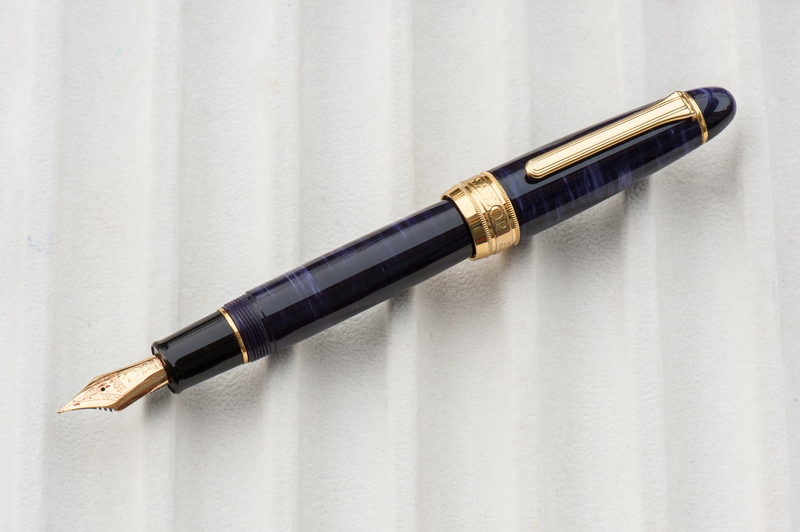 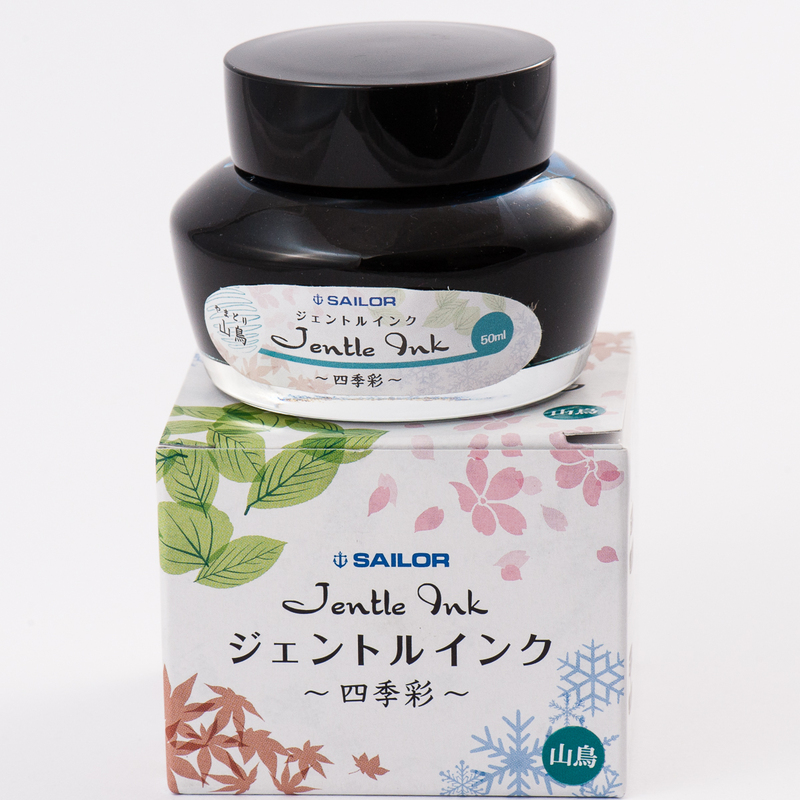 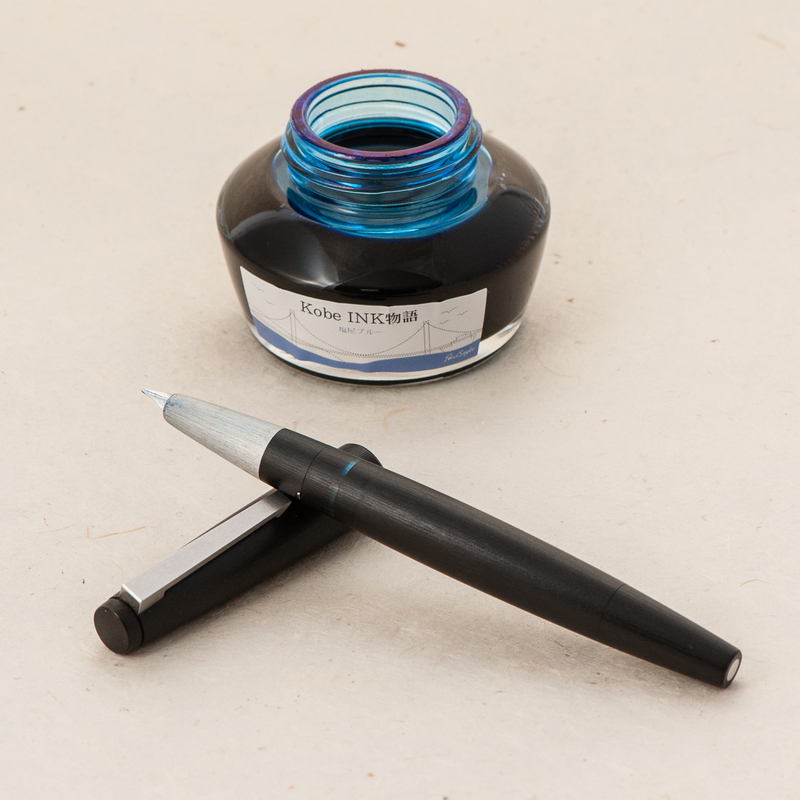 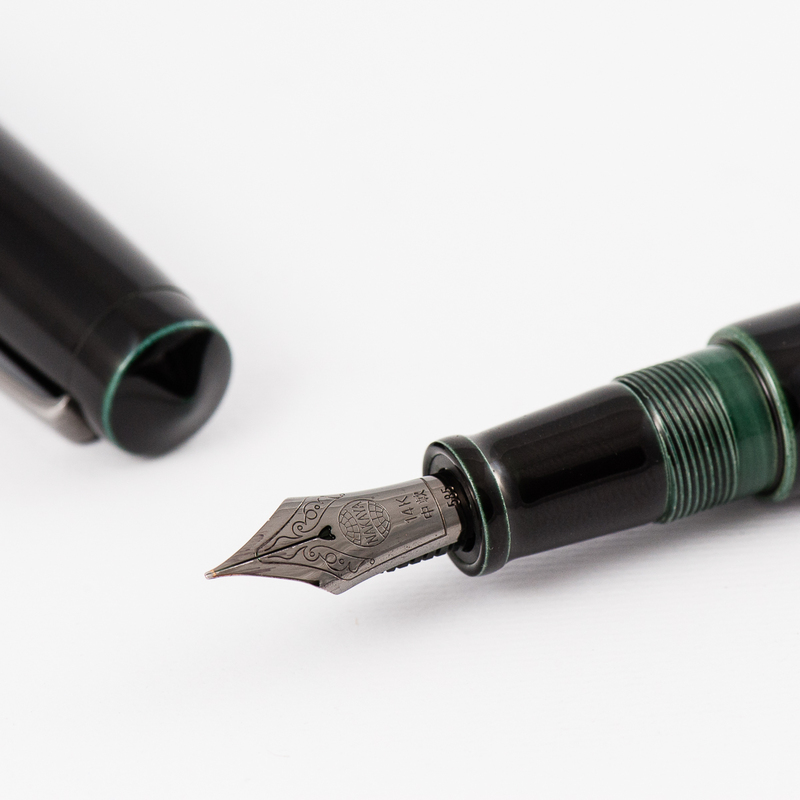 I guess you could also liken the Naka-Ai to a Pelikan M800. 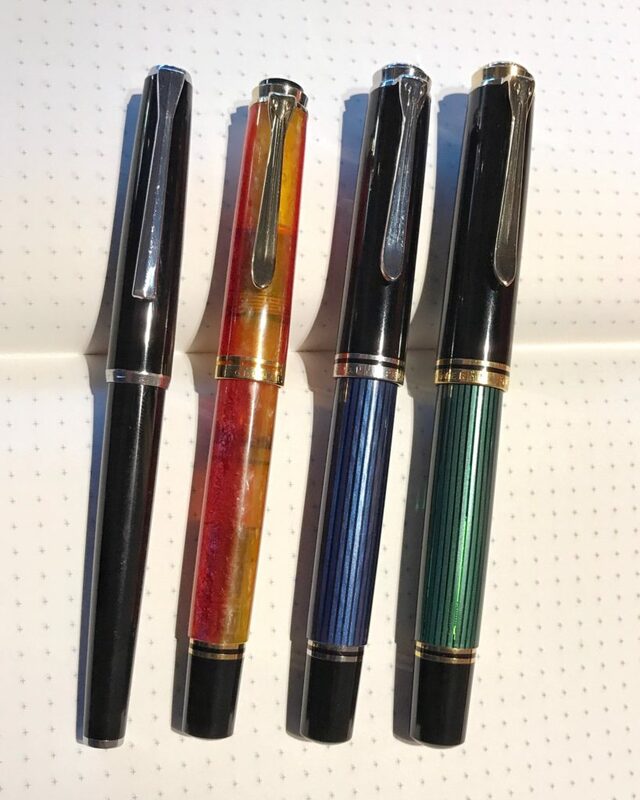 Both pens are very comfortable to write and journal with. 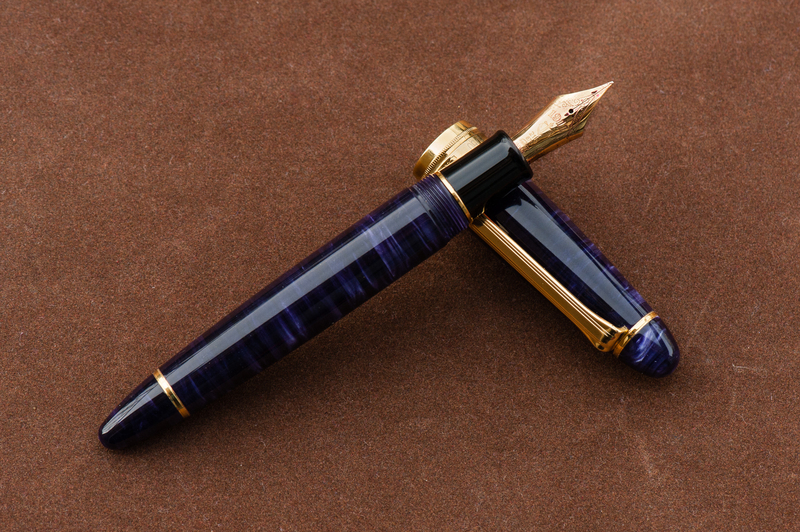 The Decapod is such a fantastic design and those facets show off the underlying urushi lacquer very nicely. 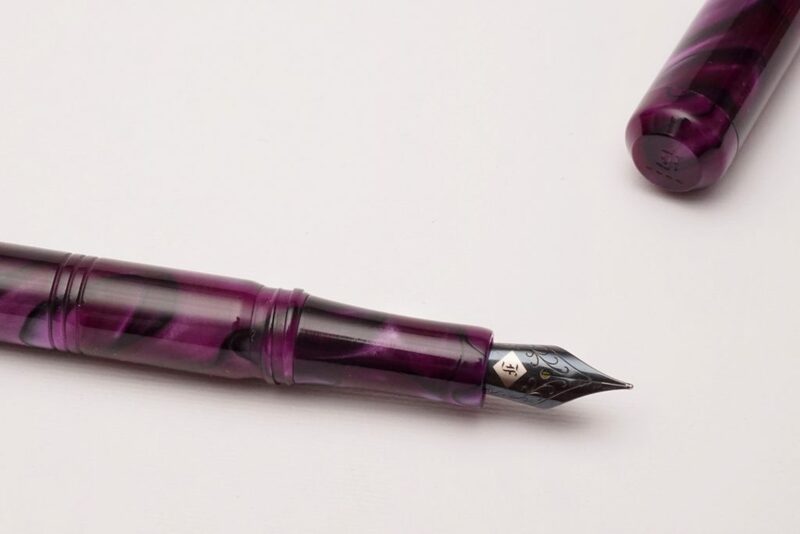 It is a slight step down in size from the Naka-Ai but the facets and the taper on the barrel and cap makes it so appealing to me. 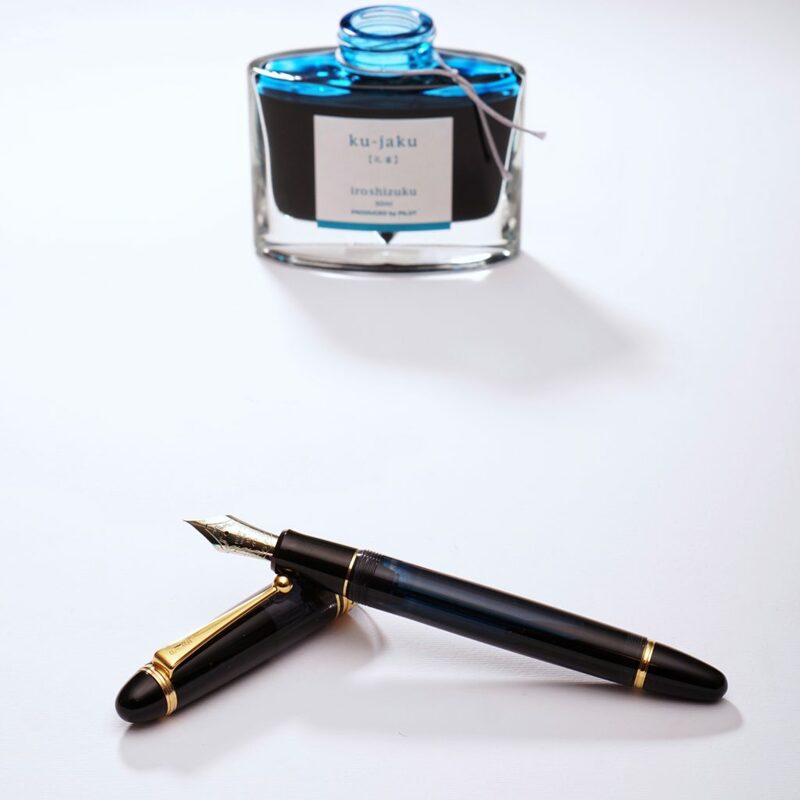 As a quick aside, almost a year ago, my facet-crazed friend named Katherine painstakingly searched for a Decapod Mini and when she found one, I’d say she wasn’t wrong to do so because it was worth it. 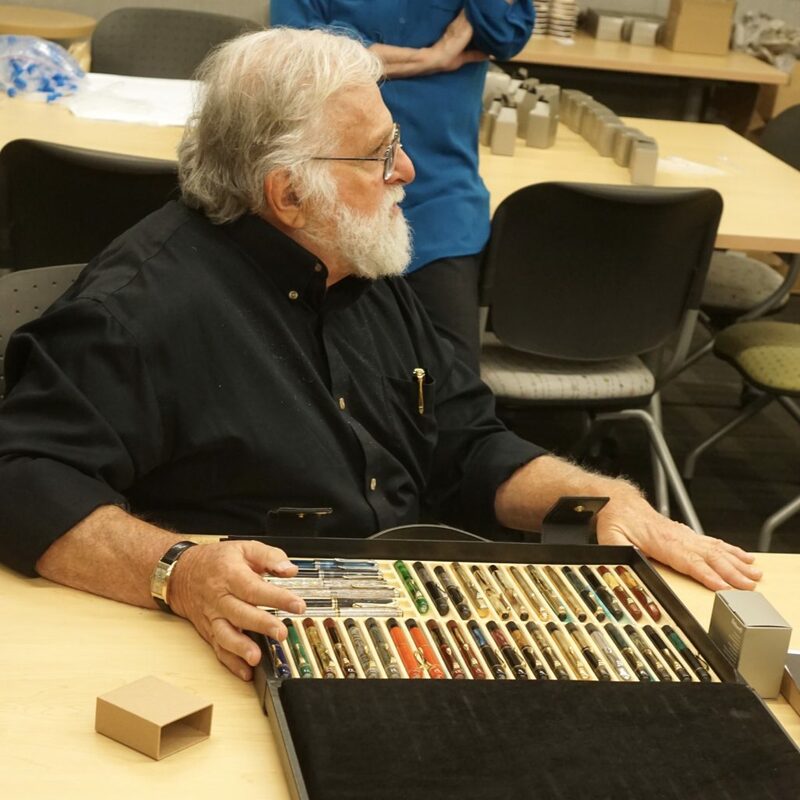 I have only recently held the Dorsal Fin models and was surprised how large they were. 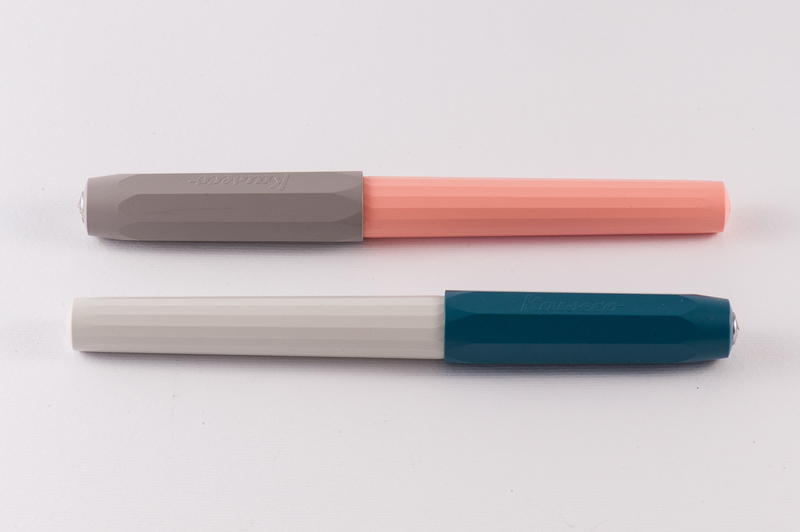 The Dorsal Fin (1 or 2) is a definite step up in terms of size from a Neo Standard, or Naka-Ai. 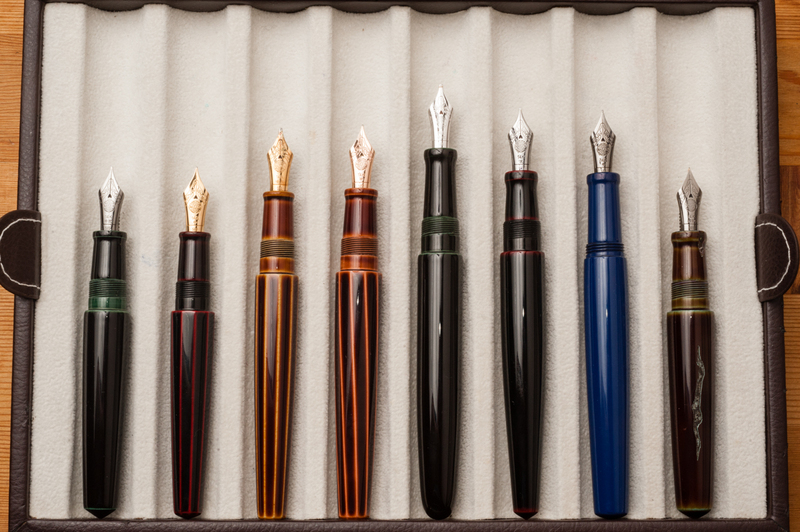 The fins on them are remarkable to look at and just delightful to hold. 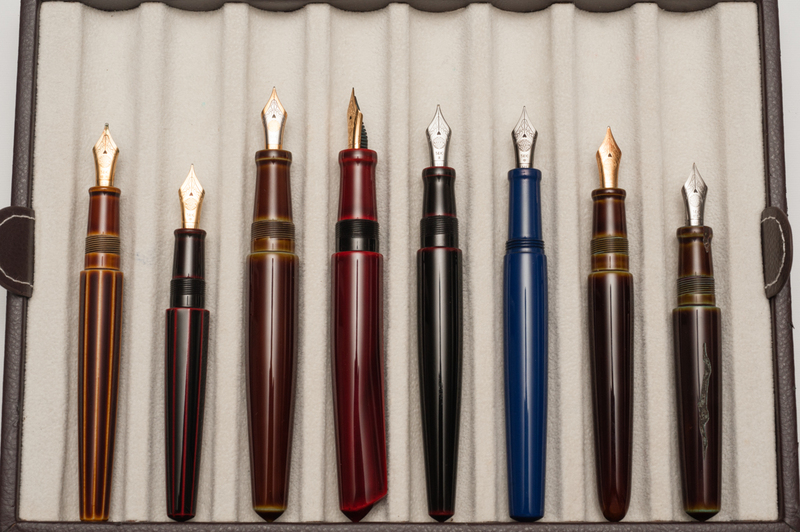 We are very fortunate to either own, or be able to borrow most of the Nakaya pen models. 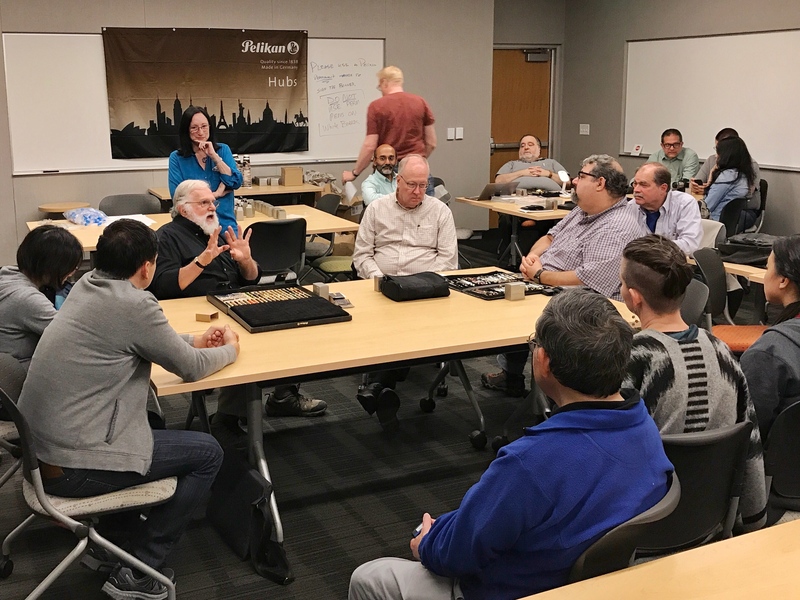 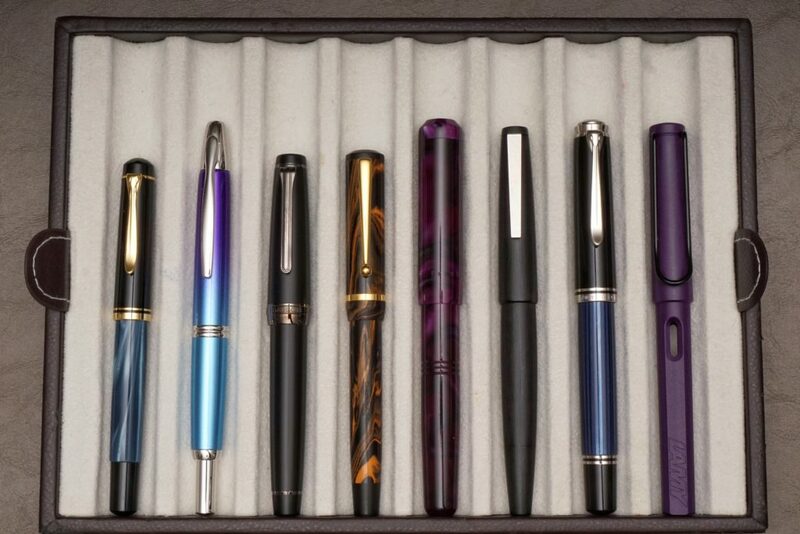 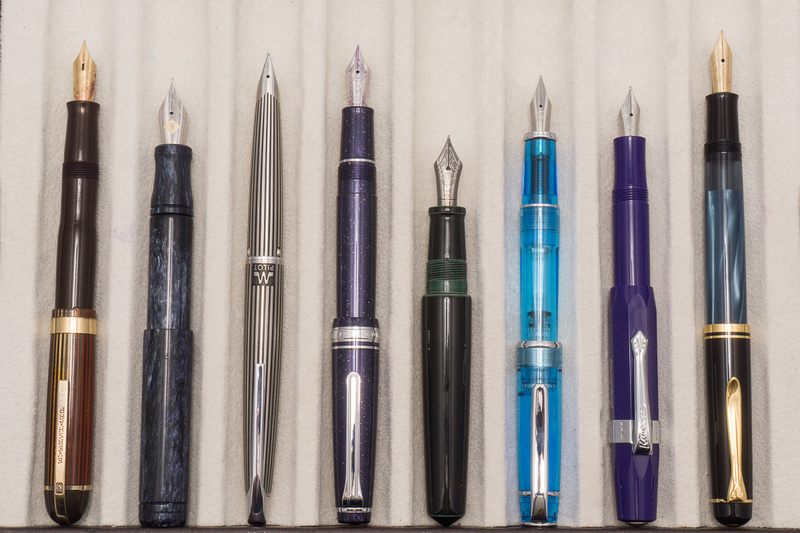 Having awesome pen friends is definitely a benefit of this great pen community. 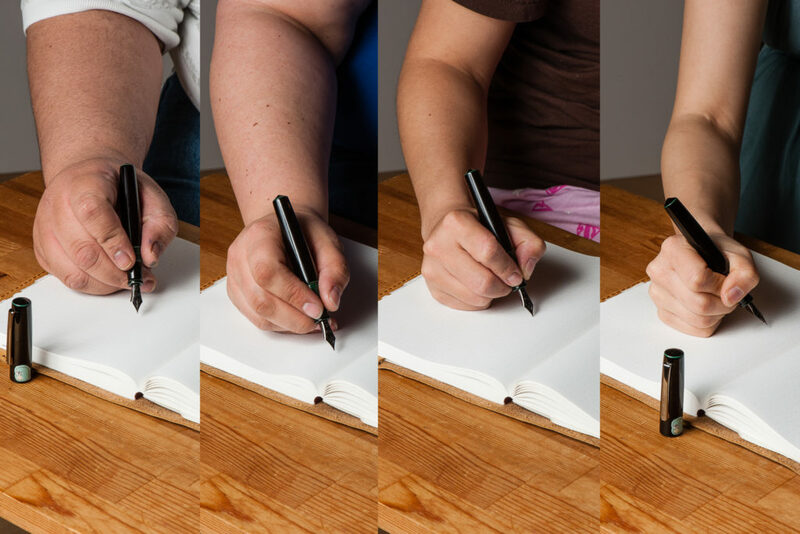 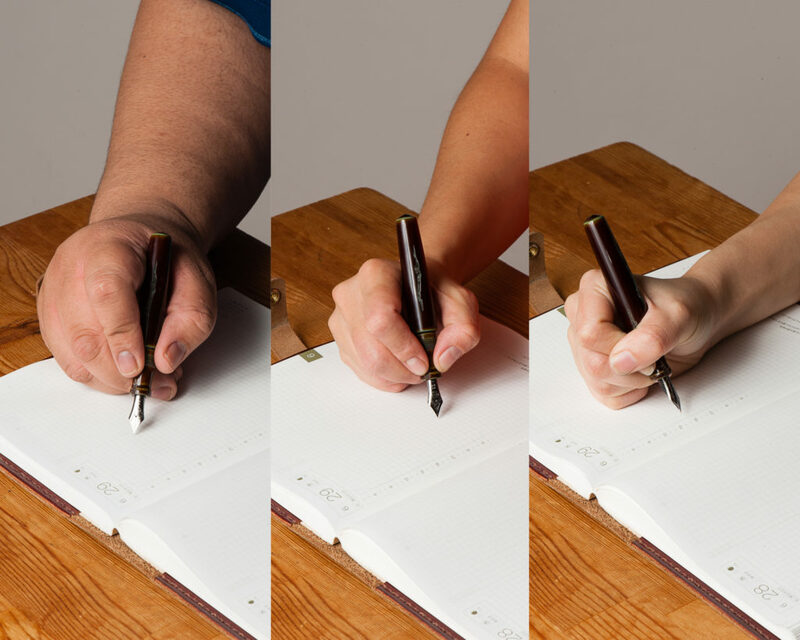 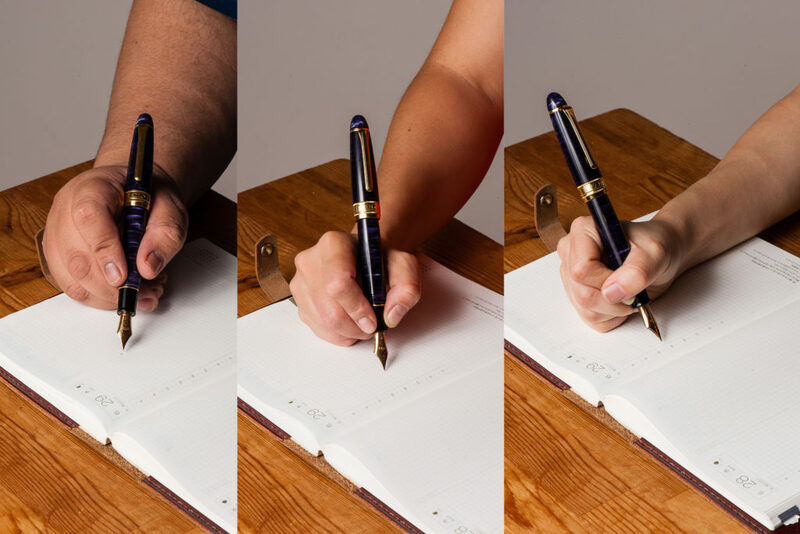 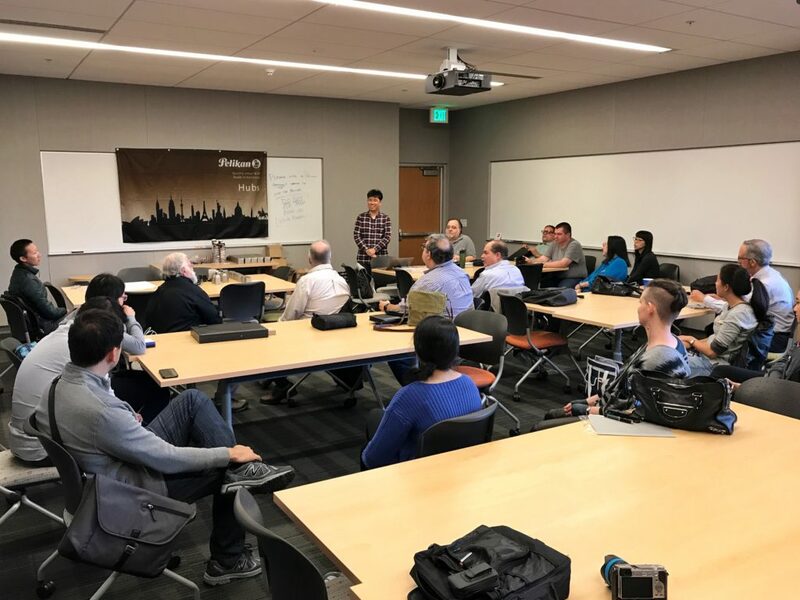 There are three sets of comparison photos and this was dependent upon the availability of the pens to be photographed. 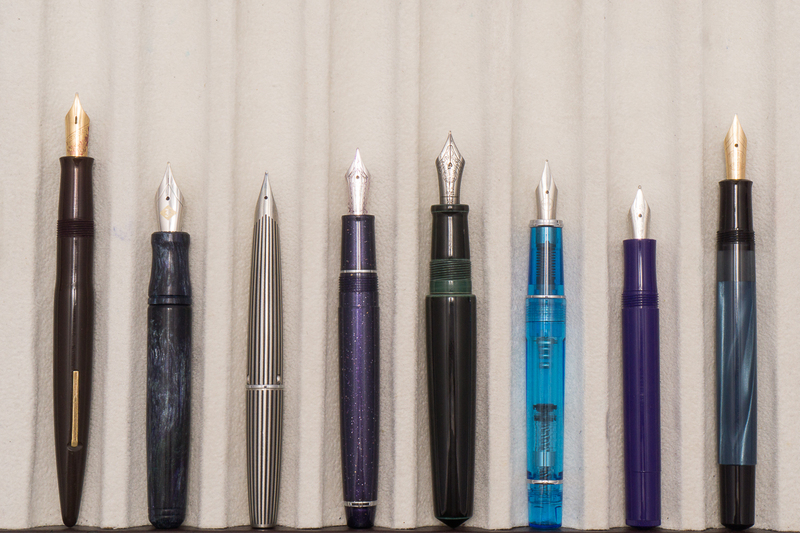 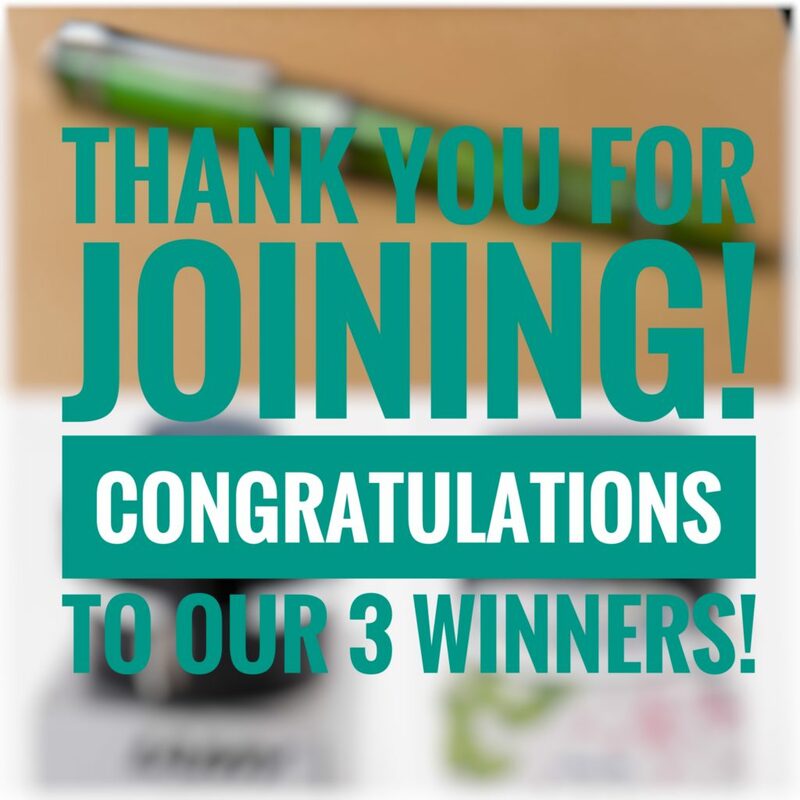 A big thanks to everyone who lent us their pens for this post. 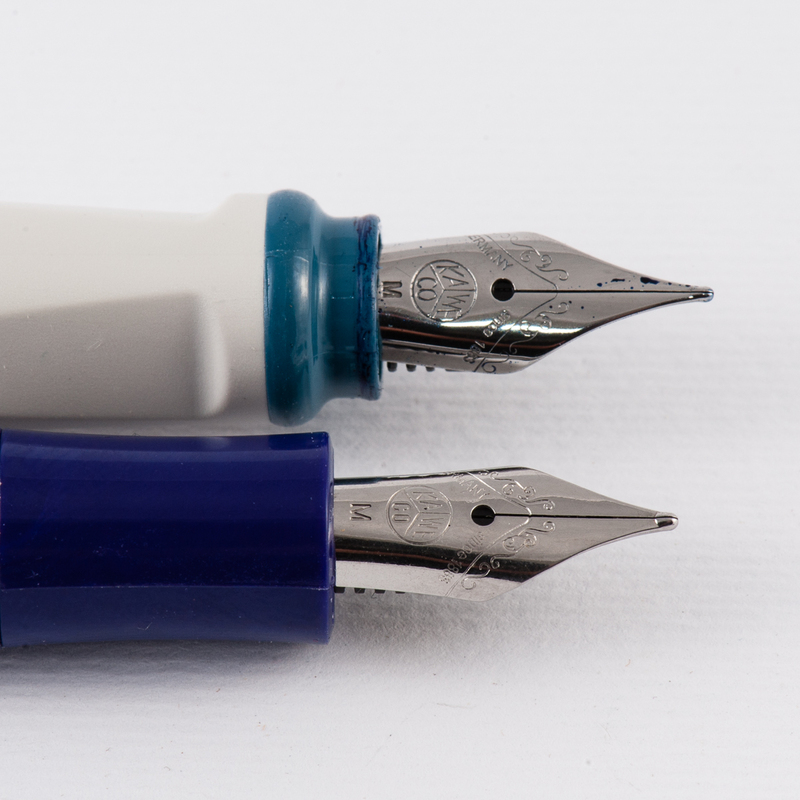 We hope you enjoyed this comparison post. 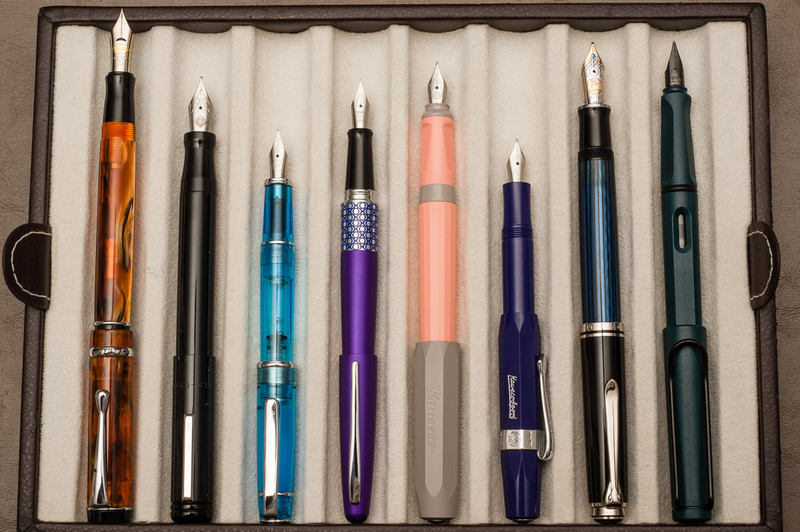 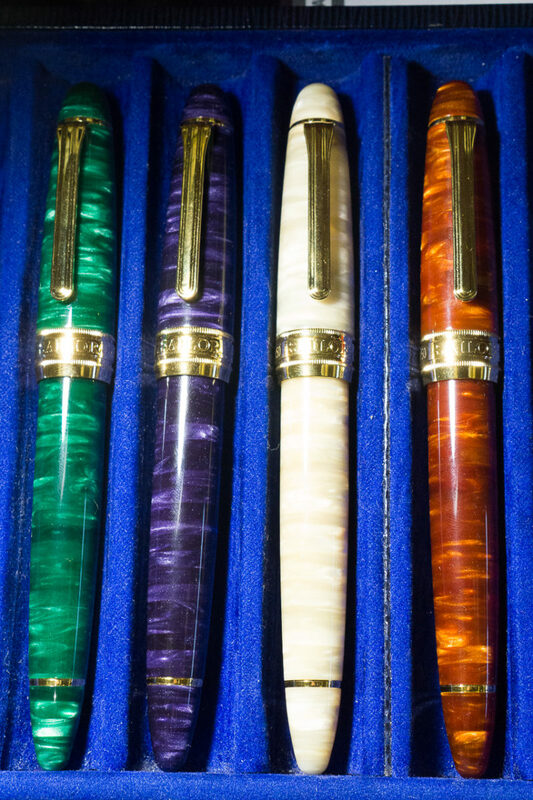 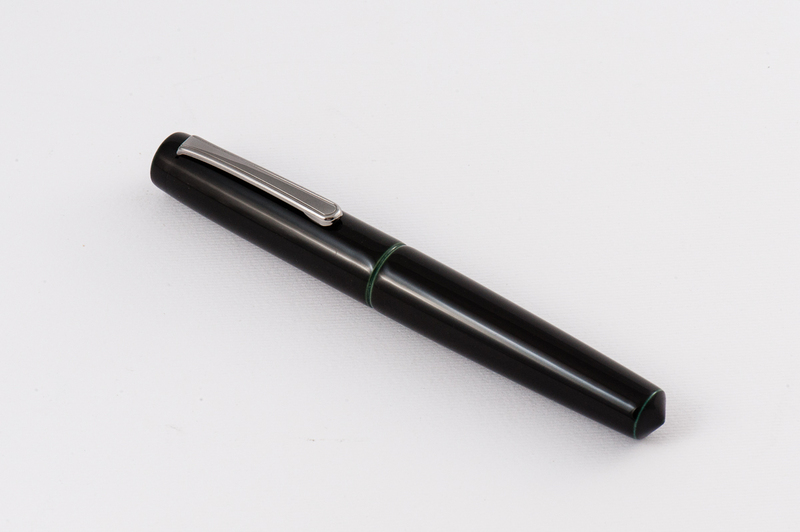 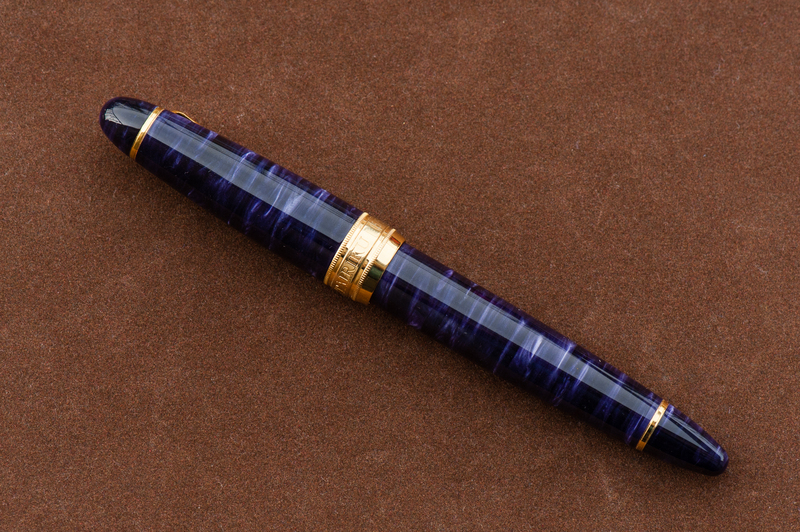 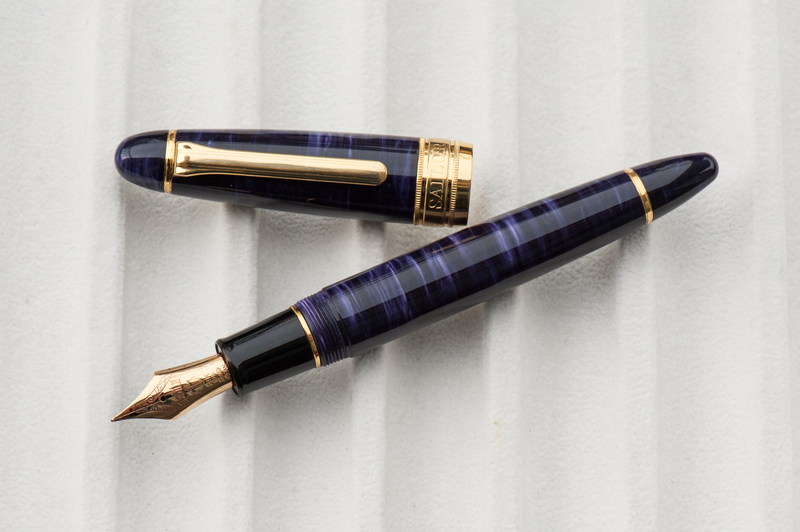 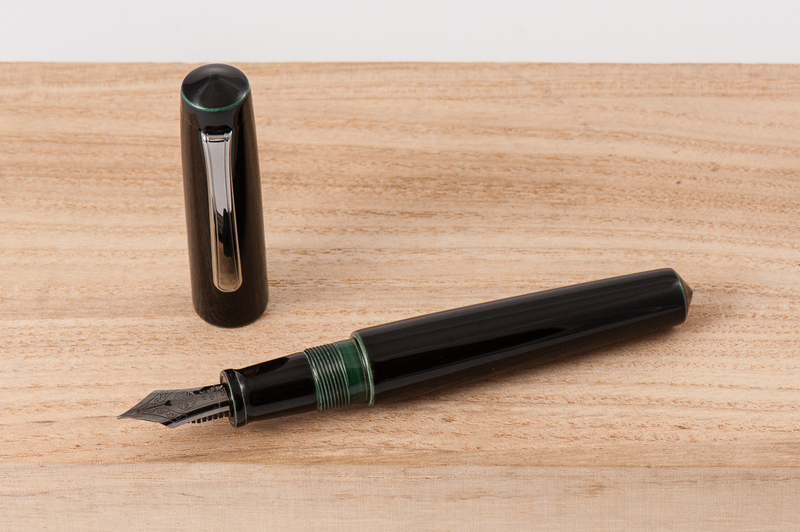 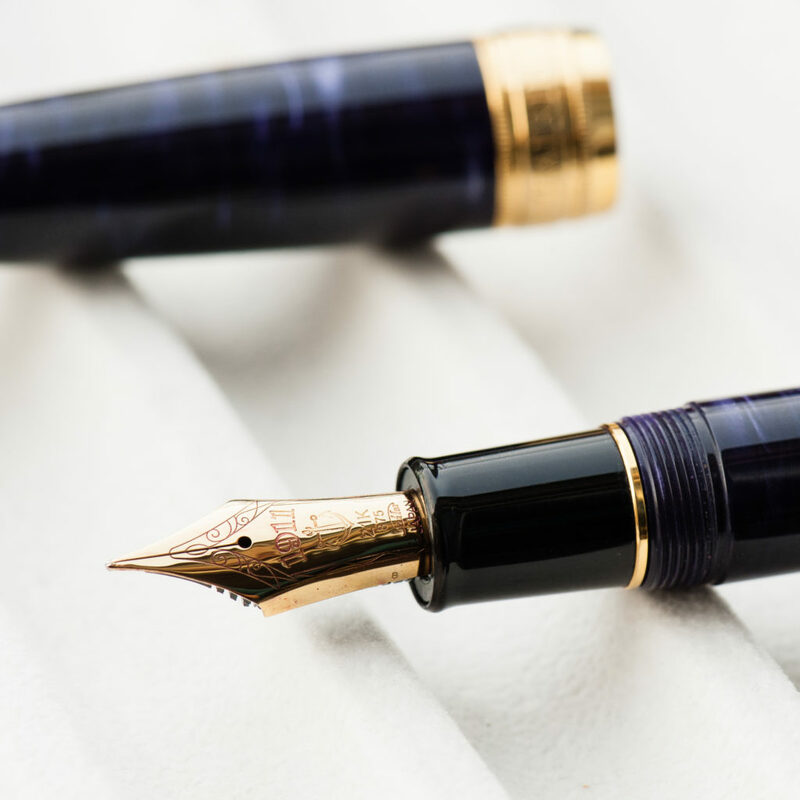 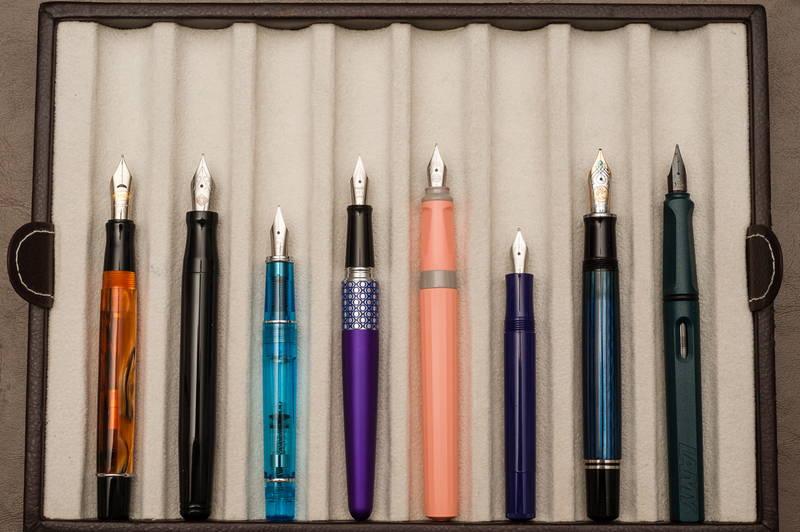 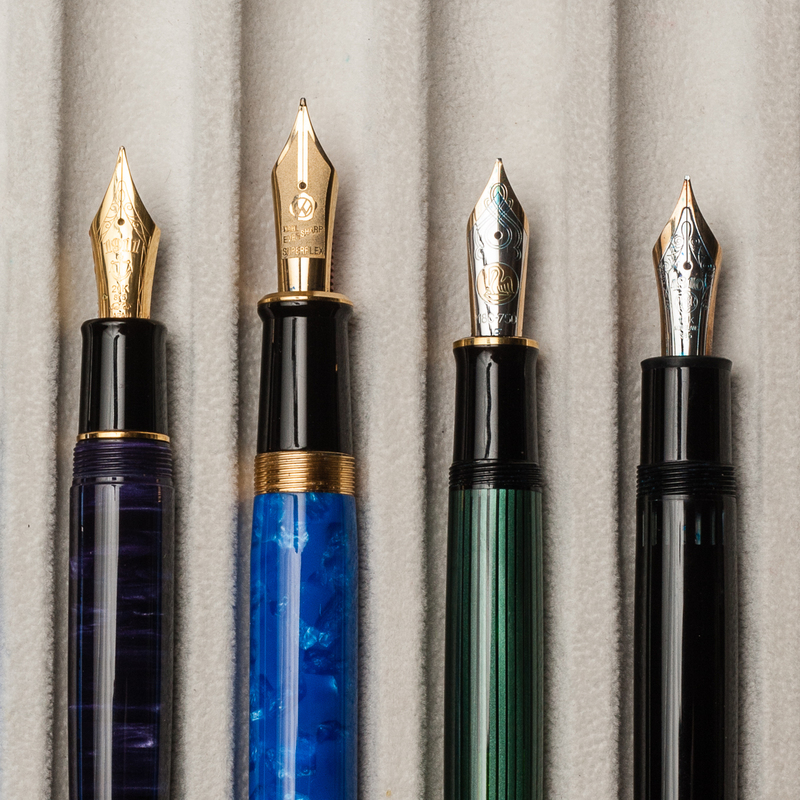 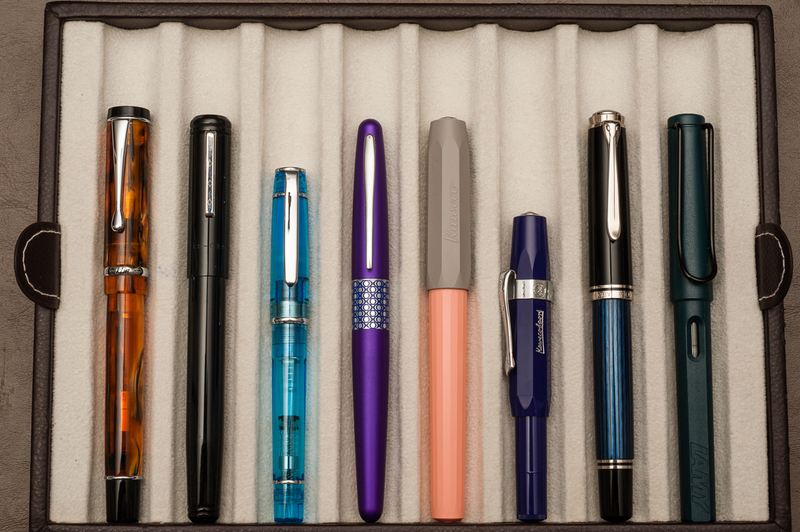 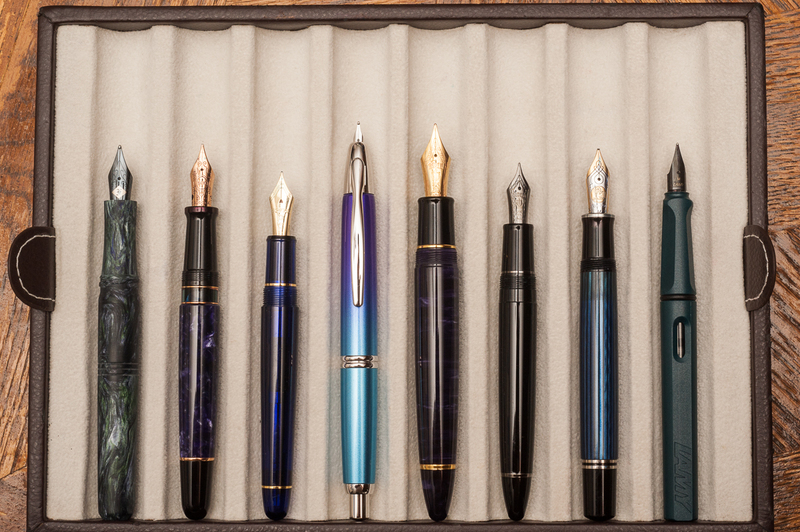 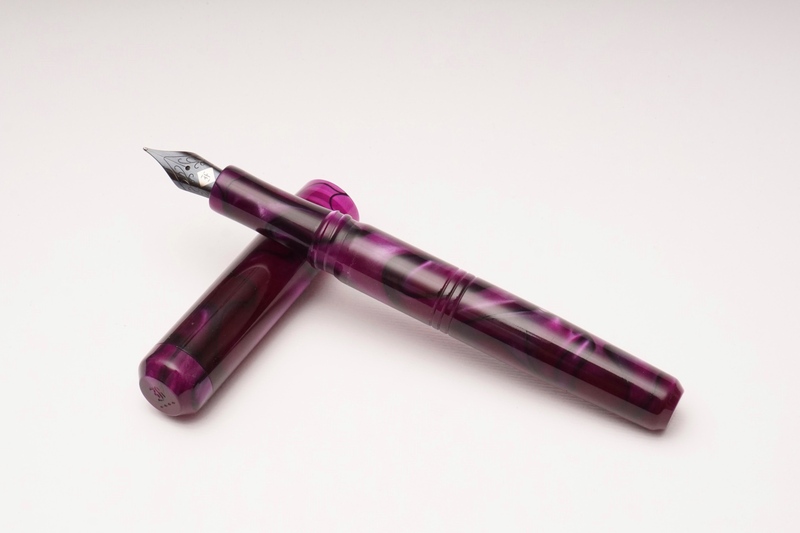 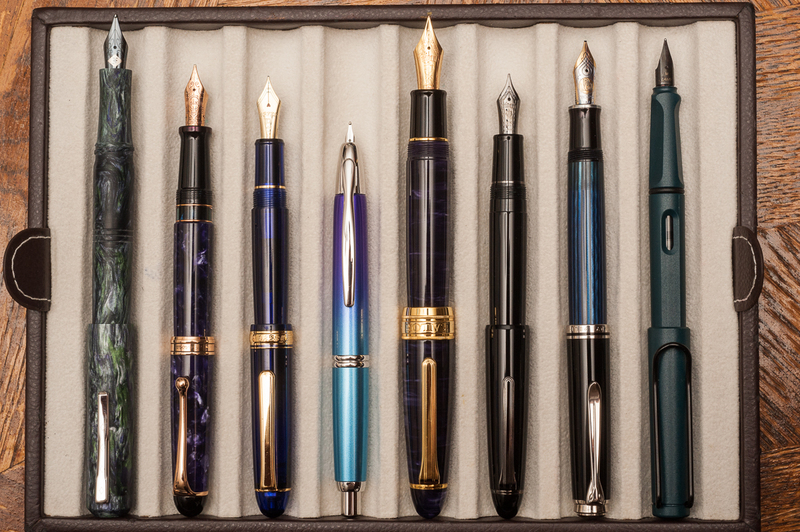 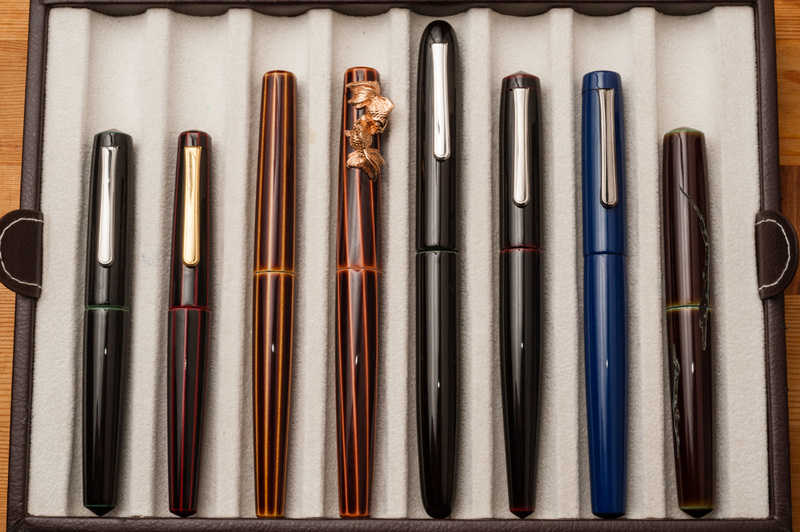 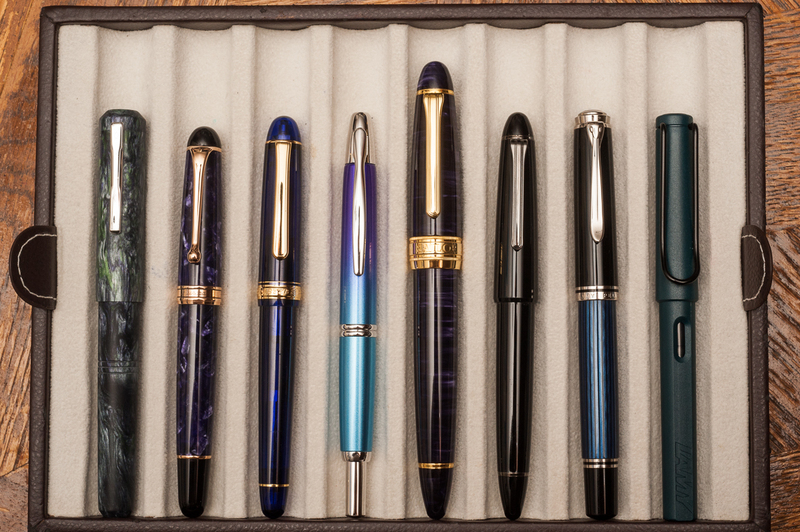 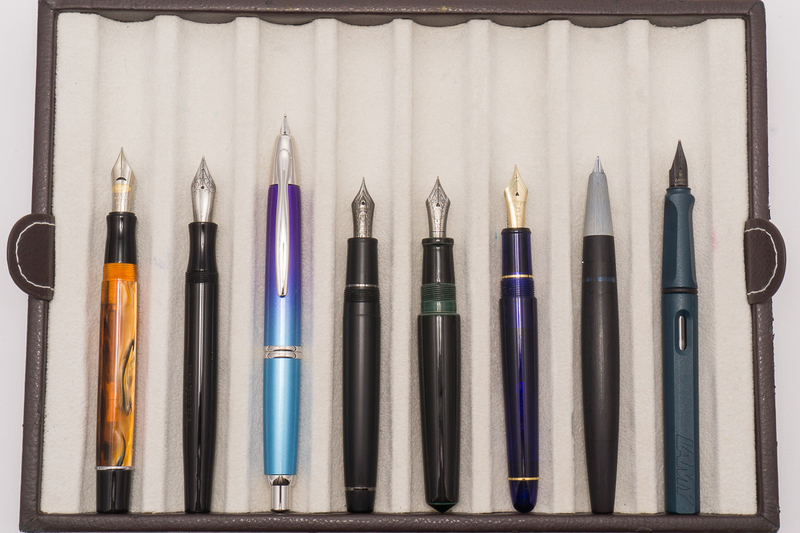 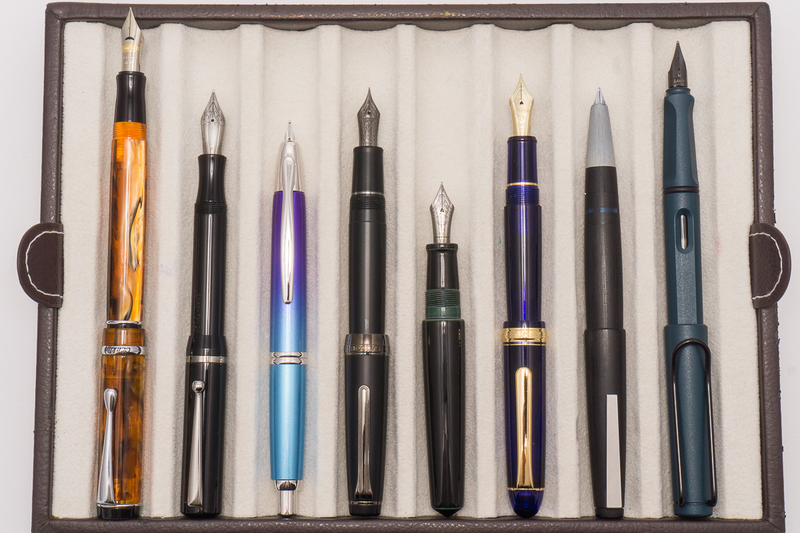 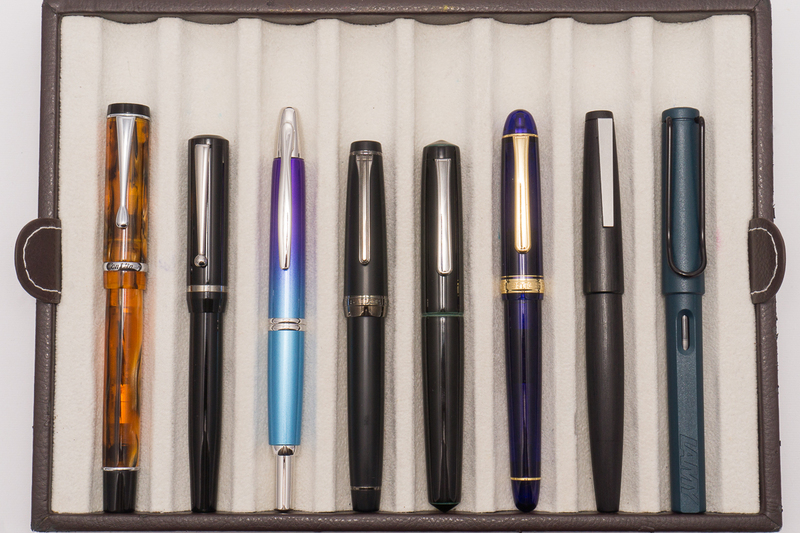 And please let us know which Nakaya model speaks to you! 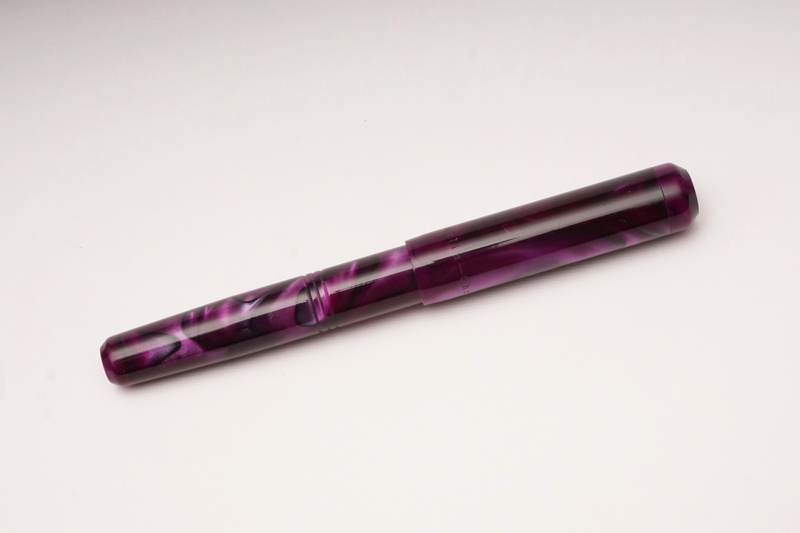 EDIT: Photos comparing the new finless Dorsal Fin are available in an addendum post.